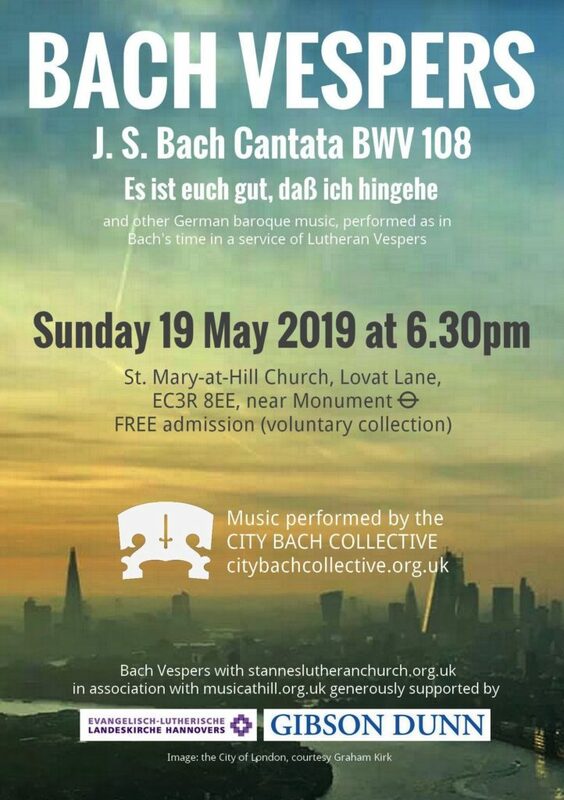 Bach Vespers on 19 May features cantata BWV 108. 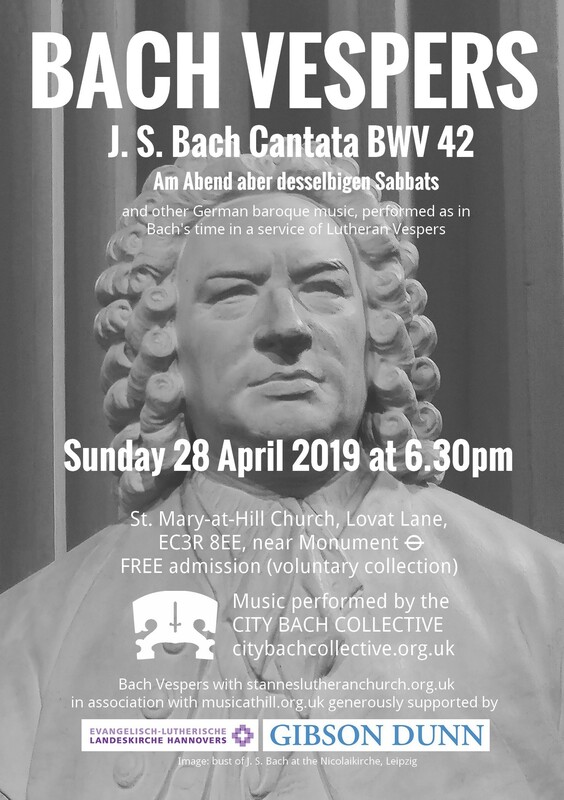 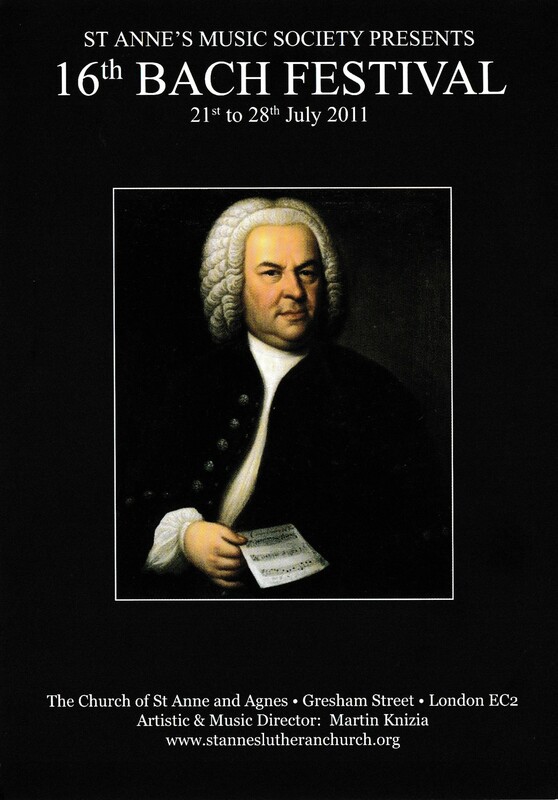 Bach Vespers on 28 April features cantata BWV 42. 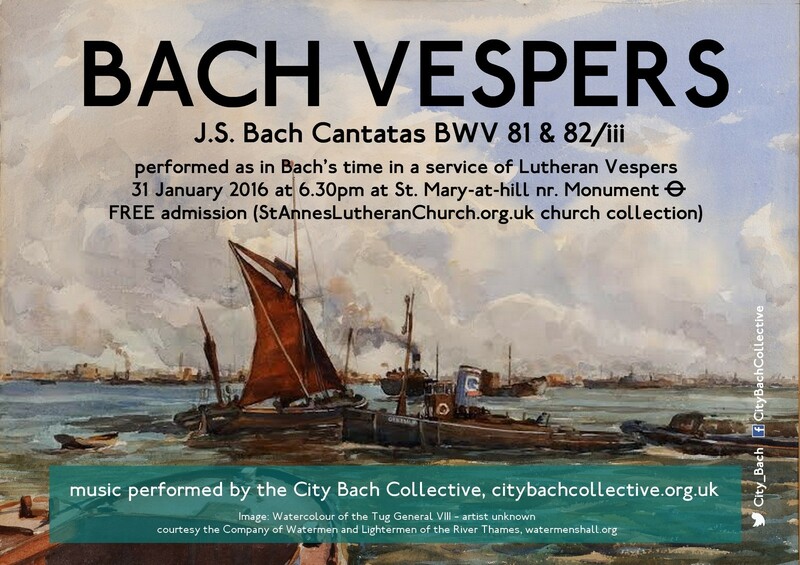 Bach Vespers on 24 February features cantata BWV 181. 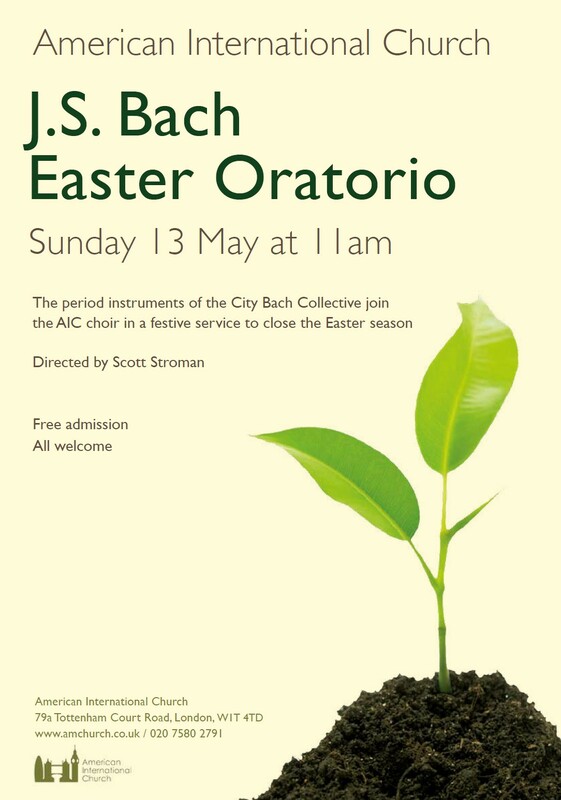 You can download the order of service here. 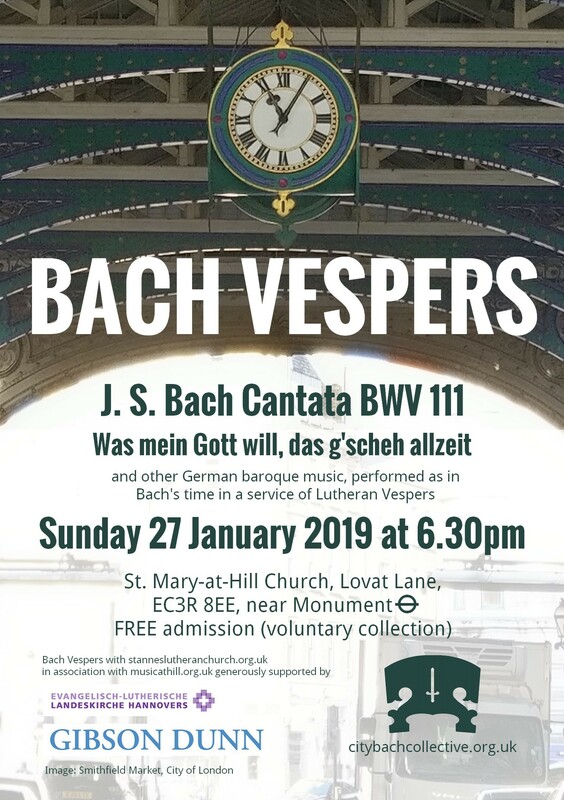 Bach Vespers on 27 January features cantata BWV 111. 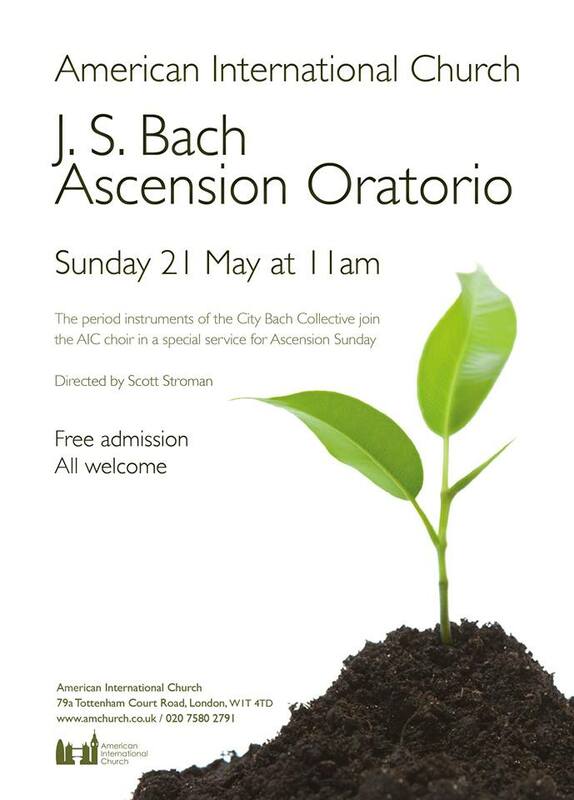 You can download the order of service here. 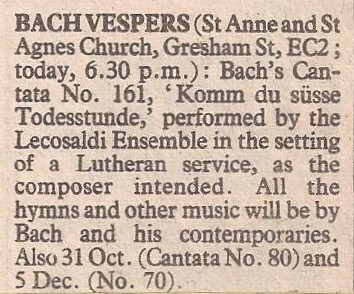 Bach Vespers on 25 November featured cantata BWV 116. 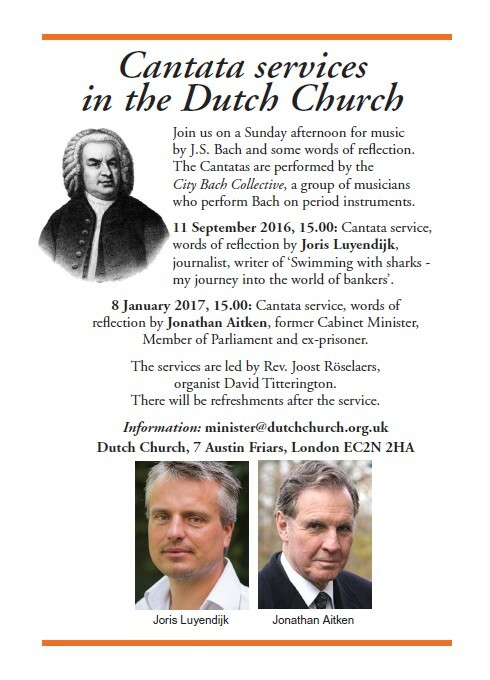 You can download the order of service here. 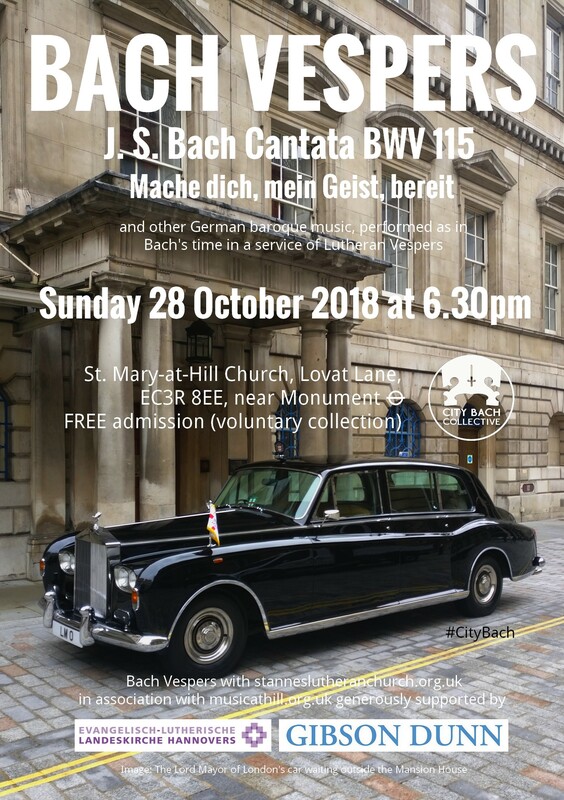 Bach Vespers on 28 October featured cantata BWV 115. 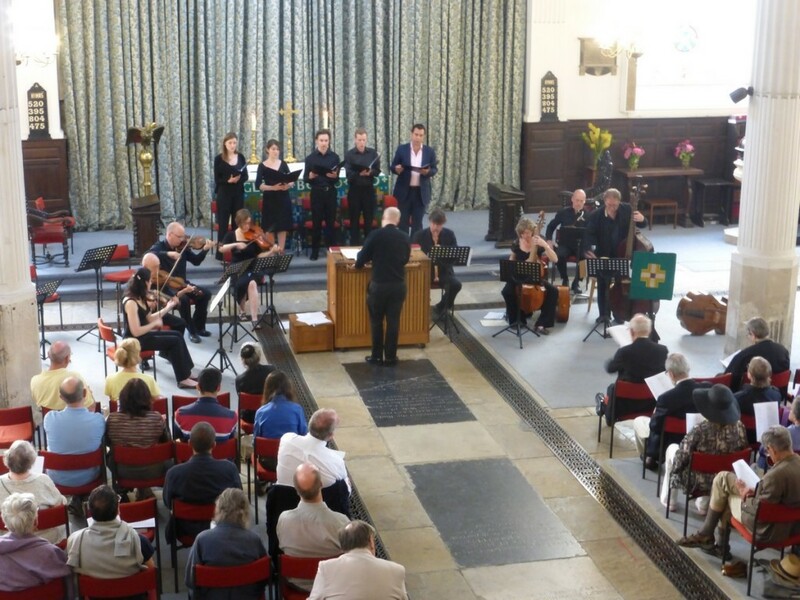 You can download the order of service here. 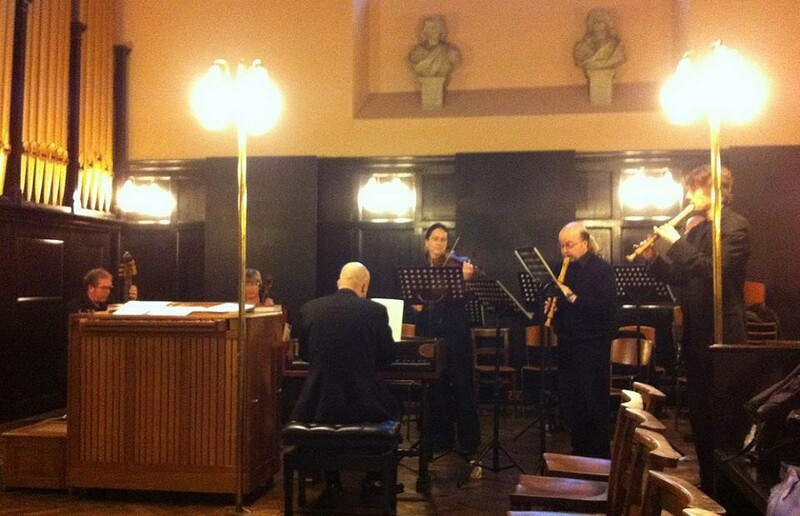 We performed cantata BWV 12 on 14 October at the Dutch Church. 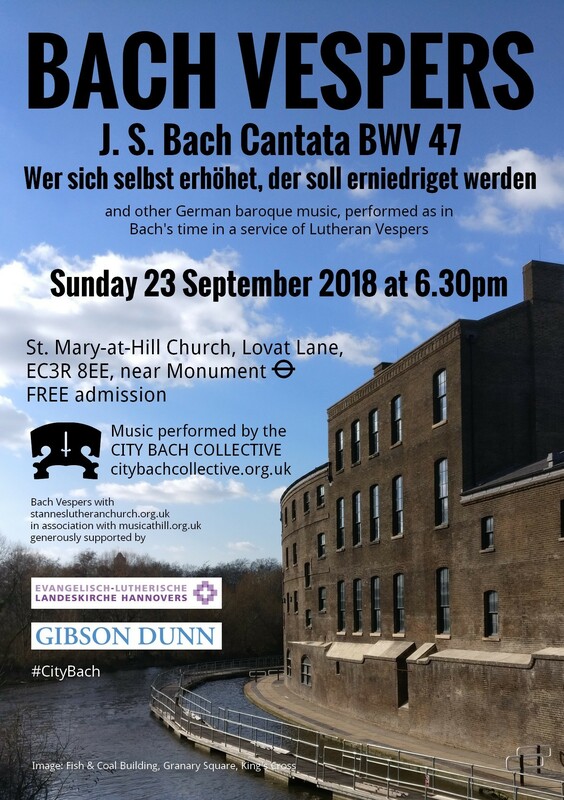 Bach Vespers on 23 September featured cantata BWV 47. 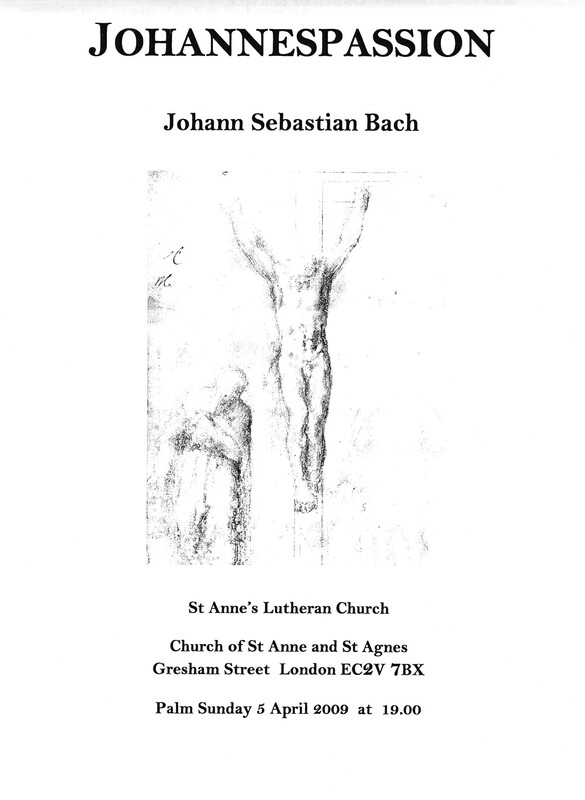 You can download the order of service here. 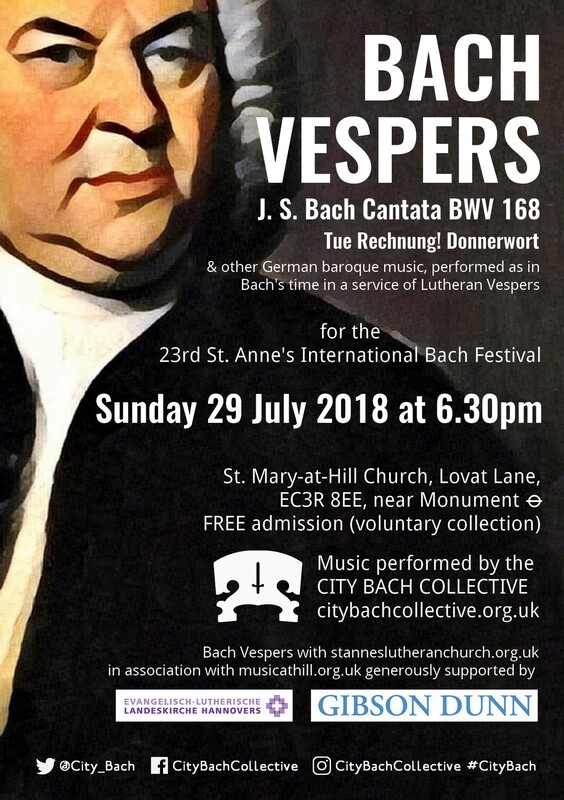 Bach Vespers on 29 July features cantata BWV 168 and Brandenburg Concerto No. 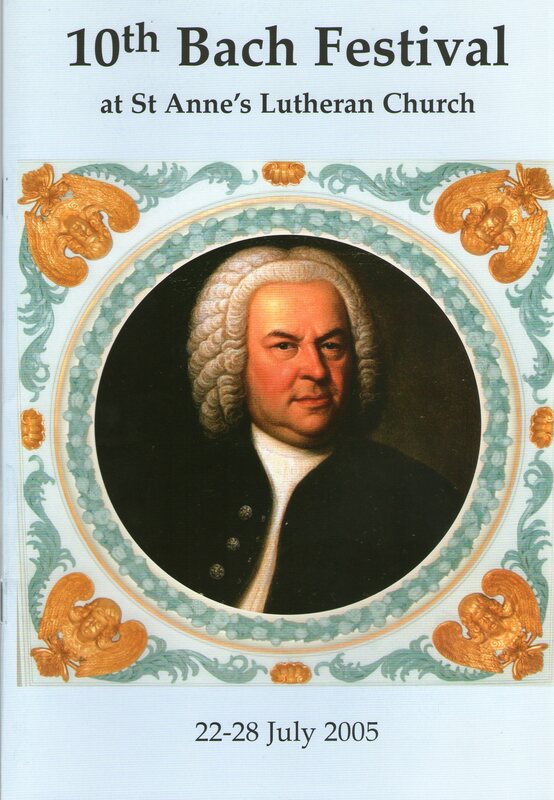 4, BWV 1049. 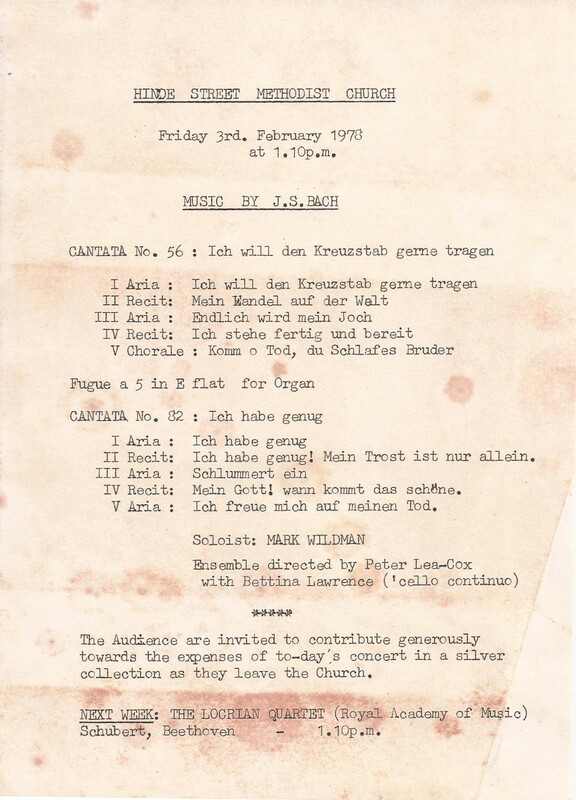 You can download the order of service here. 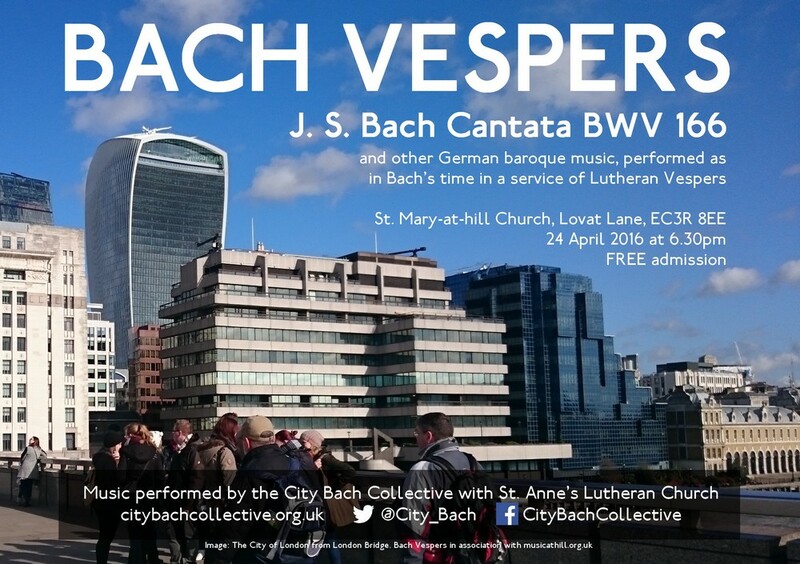 Bach Vespers on 17 June features cantata BWV 135. 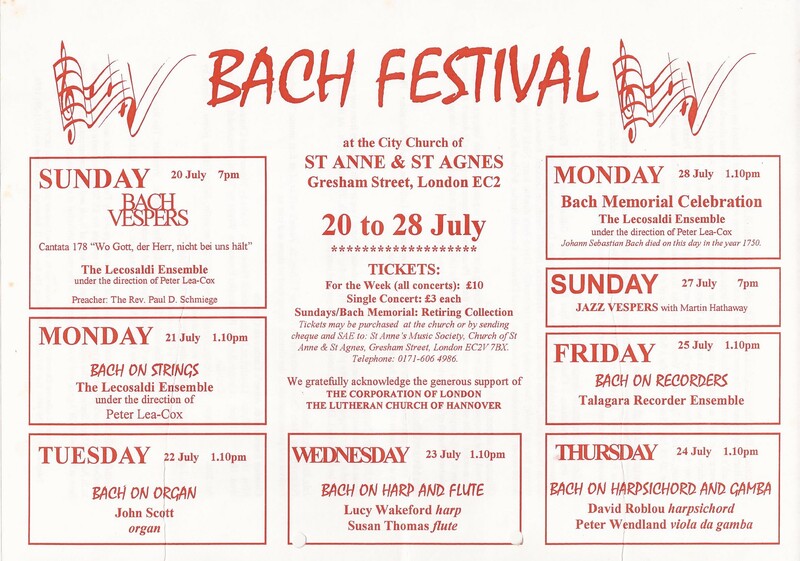 You can download the order of service here. 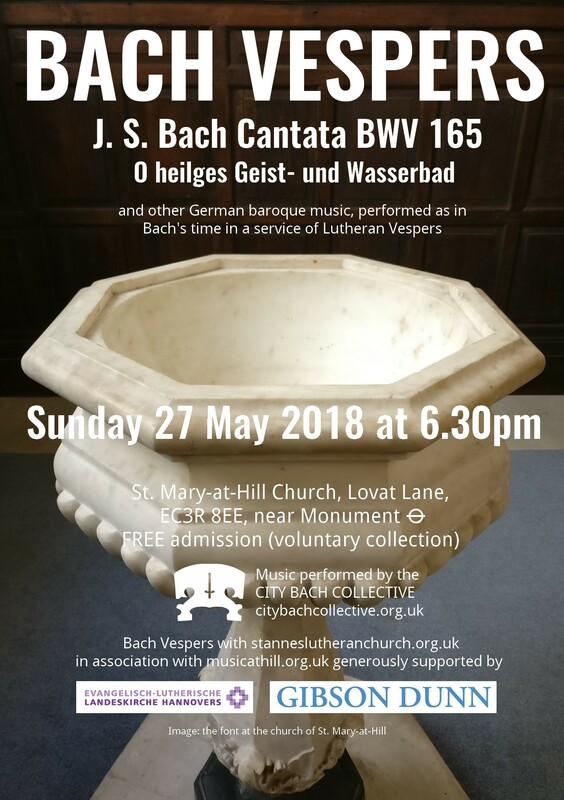 Bach Vespers on 27 May featured cantata BWV 165. 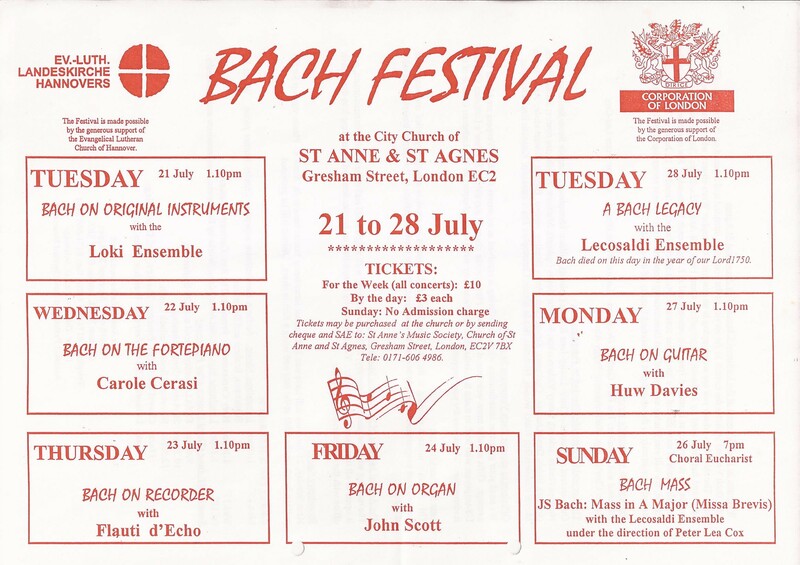 You can download the order of service here. 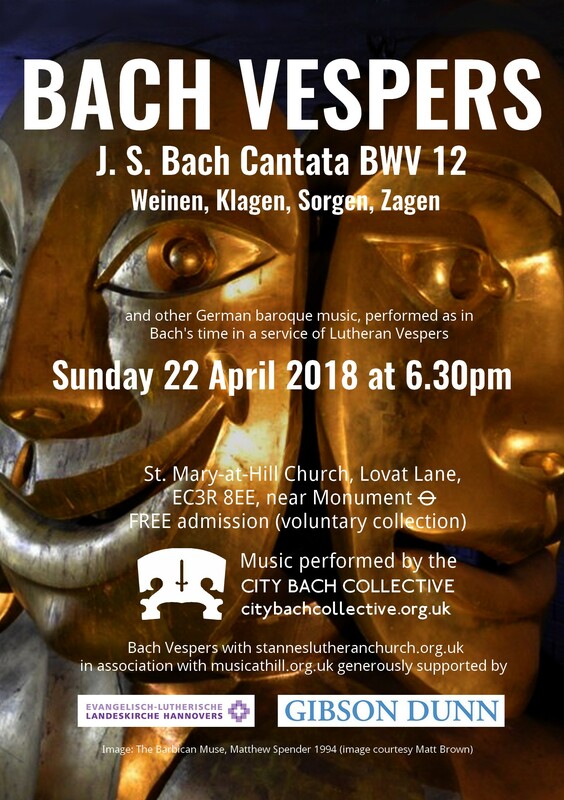 Bach Vespers on 22 April 2018 featured Cantata BWV 12. 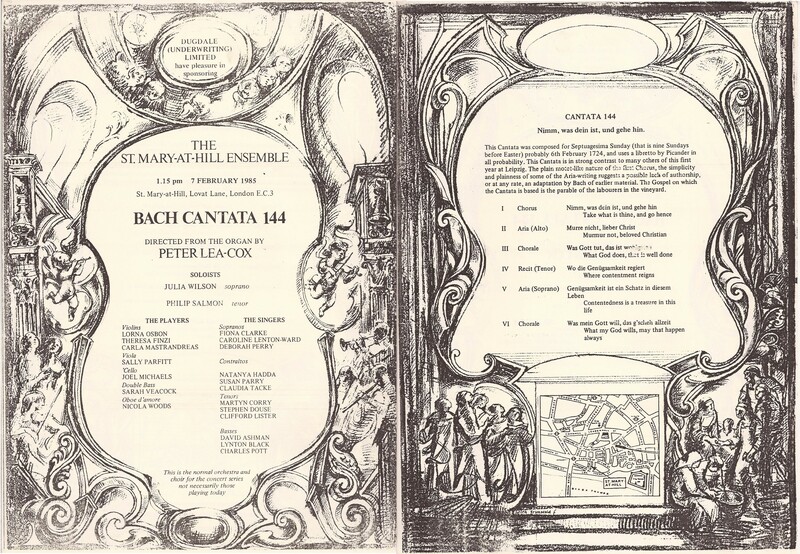 You can download the order of service here. 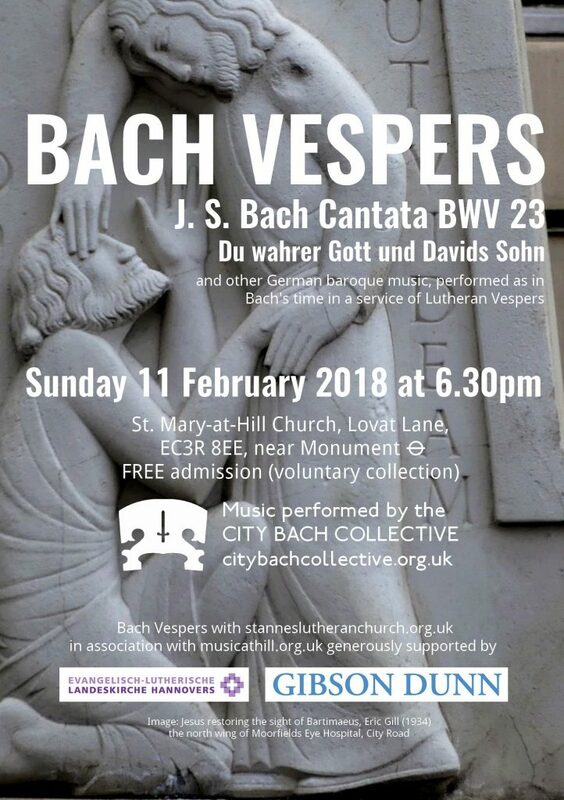 Bach Vespers on 11 February 2018 featured Cantata BWV 23. 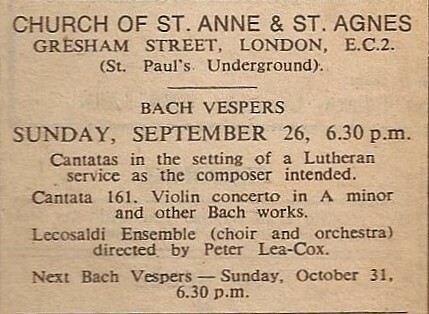 You can download the order of service here. 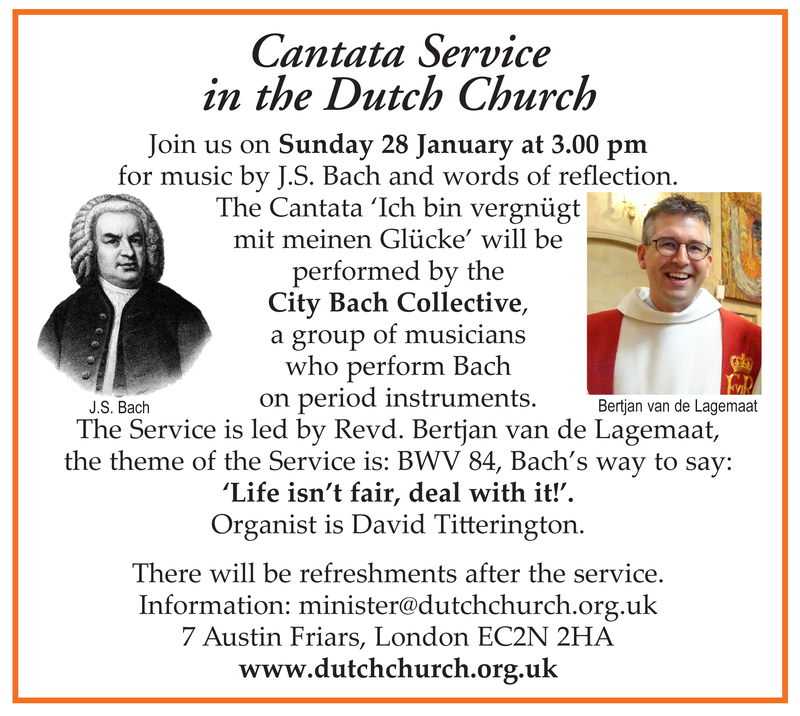 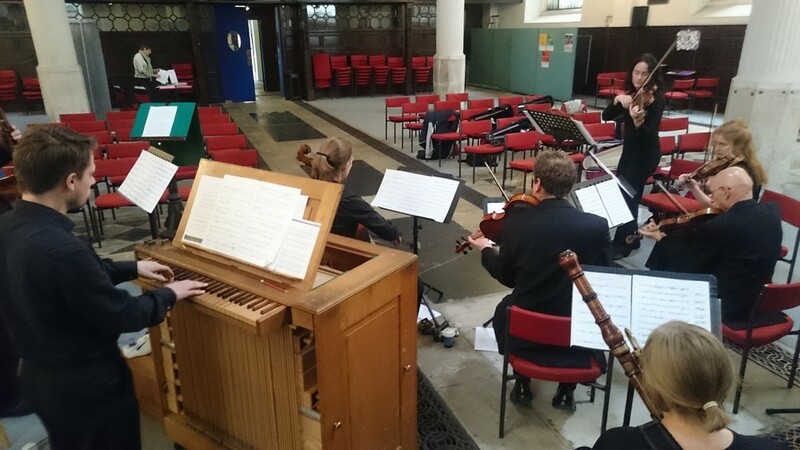 On 28 January, we performed Cantata BWV 84 and the motet Lobet den Herrn BWV 230 at the Dutch Church in London. 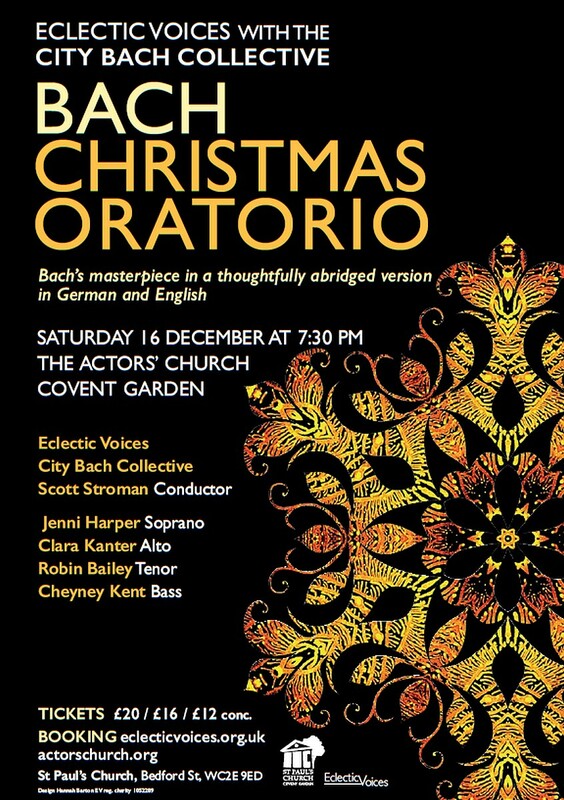 On 16 December 2017 we performed parts 1, 2&3 abridged, 5 & 6 of J. S. Bach’s Christmas Oratorio in both German and English. 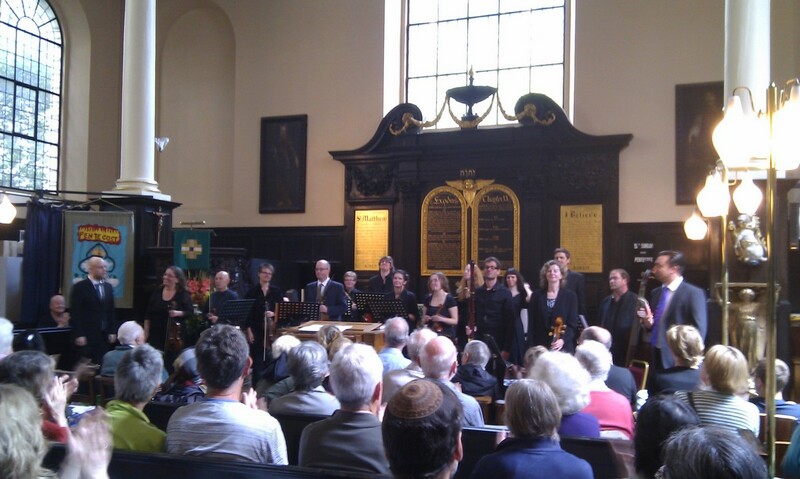 We were joined by the north London amateur choir Eclectic Voices with their director Scott Stroman conducting. 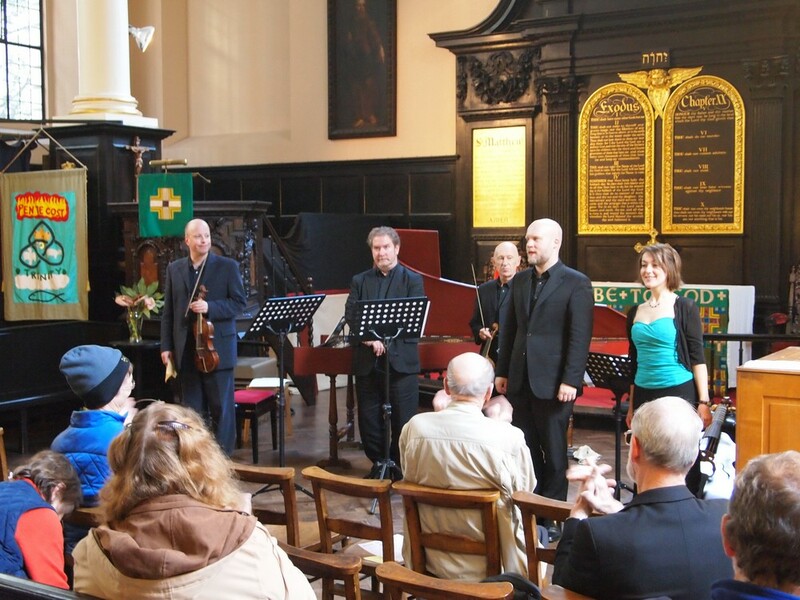 The church of St. Paul Covent Garden, also known as ‘the Actor’s Church’ was almost full and the performance warmly received. 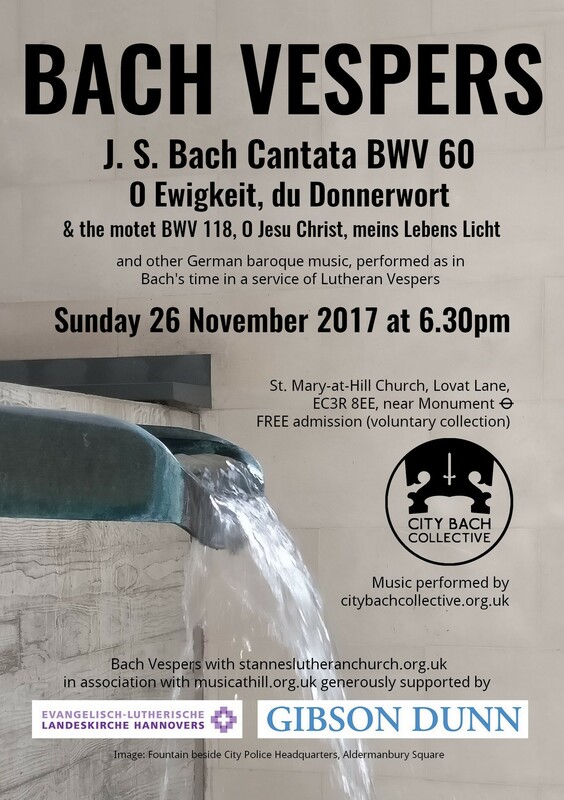 Bach Vespers on 26 November 2017 featured Cantata BWV 60. 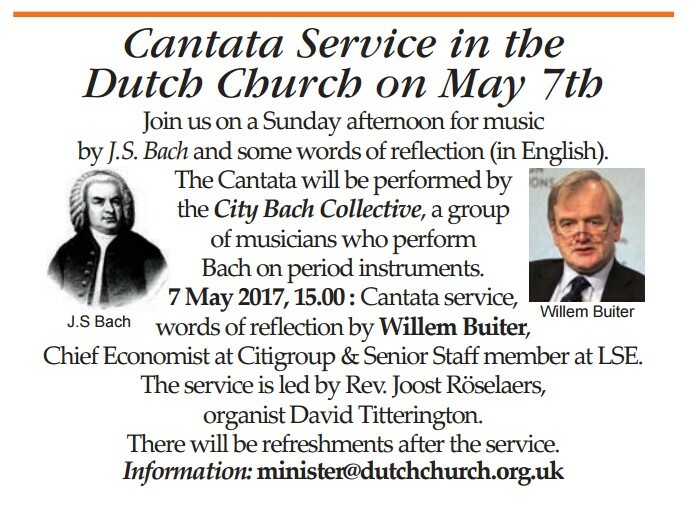 You can download the order of service here. 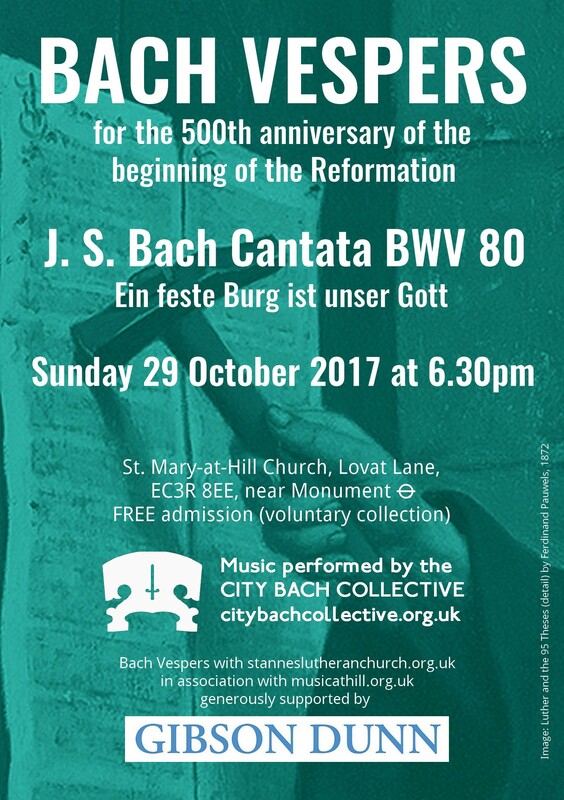 Bach Vespers on 29 October 2017 featured Cantata BWV 80. 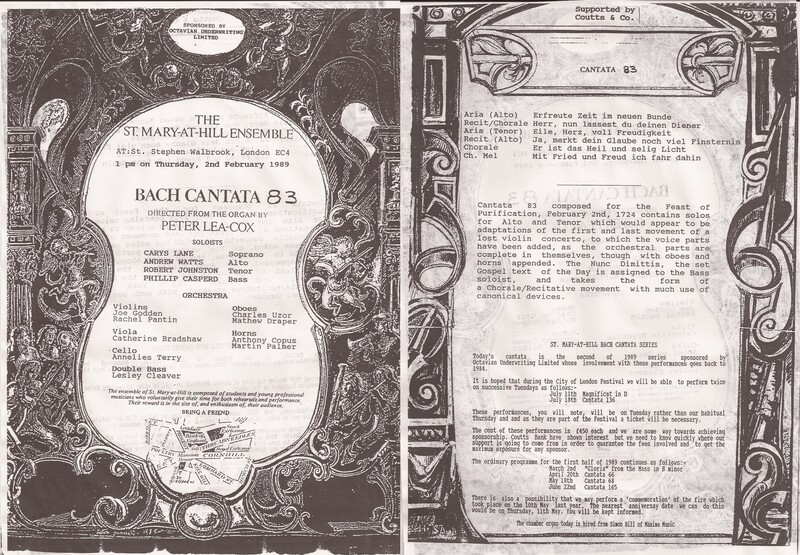 You can download the order of service here. 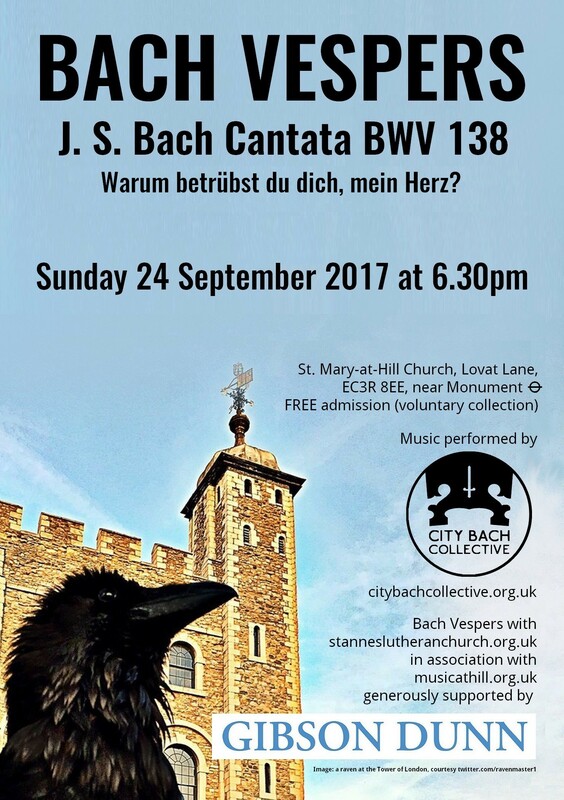 Bach Vespers on 24 September 2017 featured Cantata BWV 138. 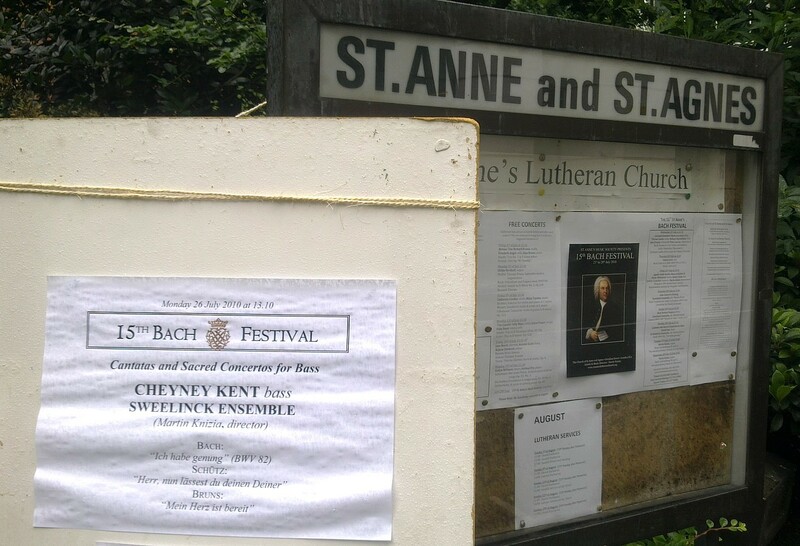 You can download the order of service here. 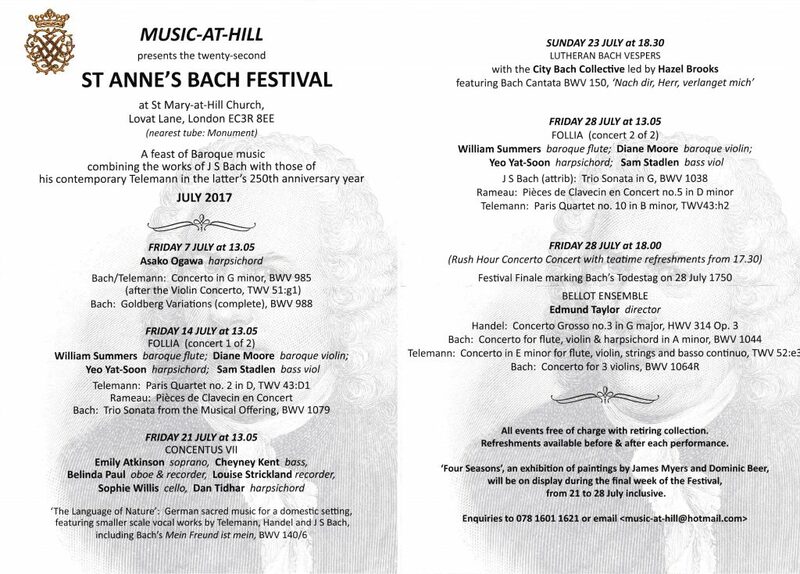 The 22nd St. Anne’s International Bach Festival is held in July 2017 at St. Mary-at-Hill Church. 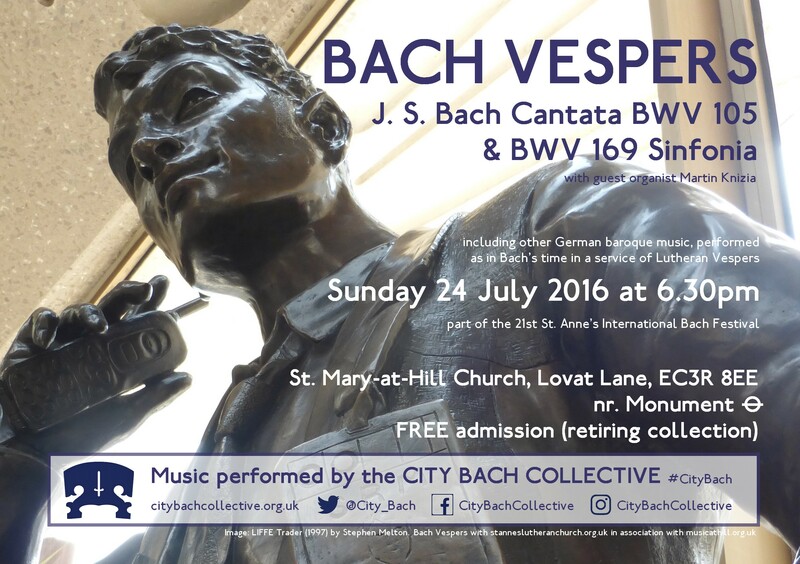 The City Bach Collective perform cantata BWV 150, Nach dir, Herr, verlanget mich on 23 July. 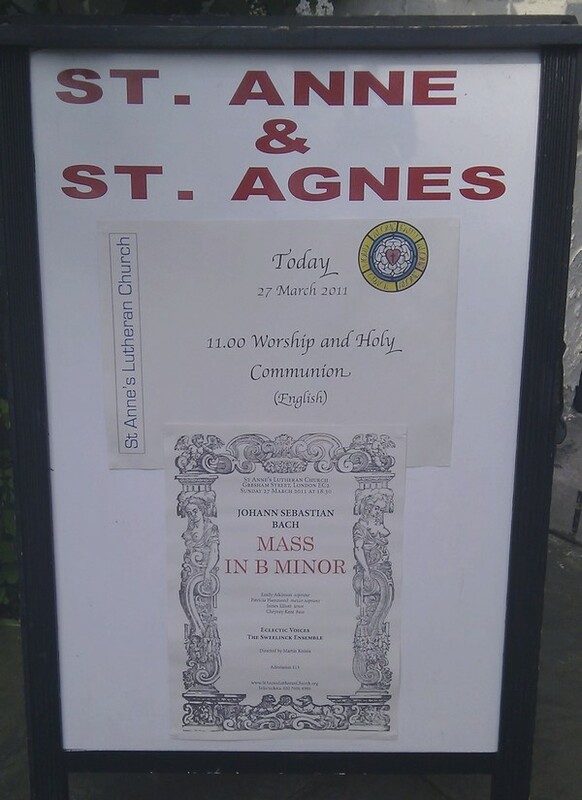 You can download the order of service here. 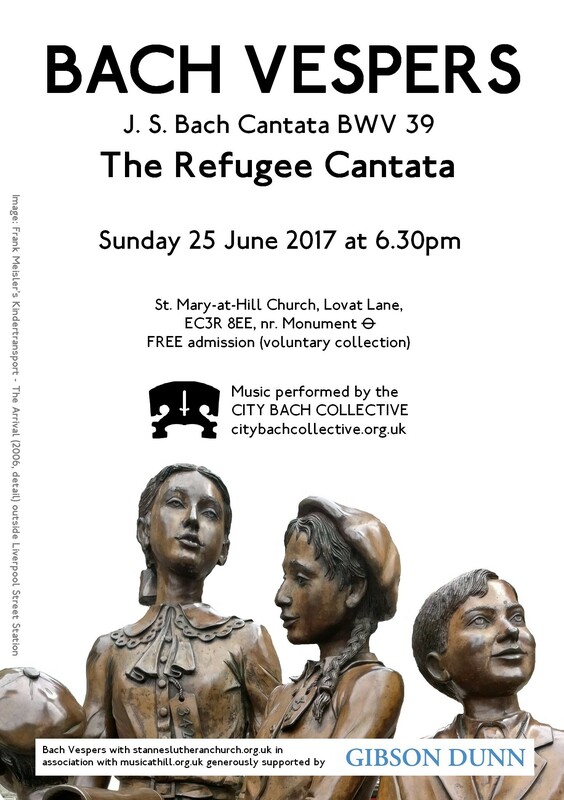 Bach Vespers on 25 June 2017 featured Cantata BWV 39, the ‘Refugee Cantata’. 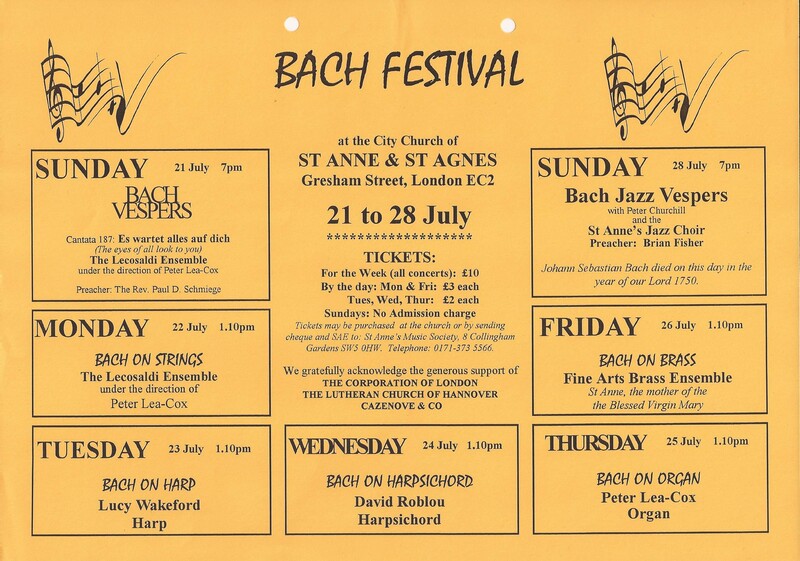 You can download the order of service here. 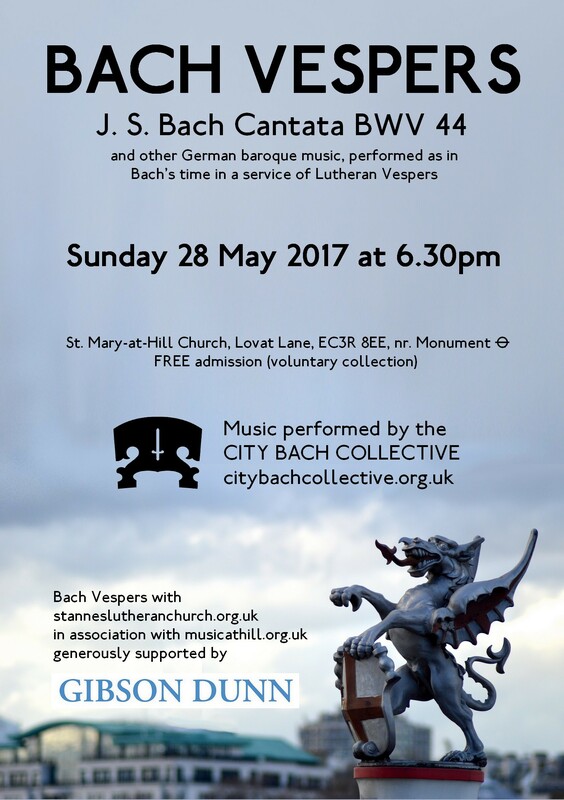 Bach Vespers on 28 May 2017 featured Cantata BWV 44. 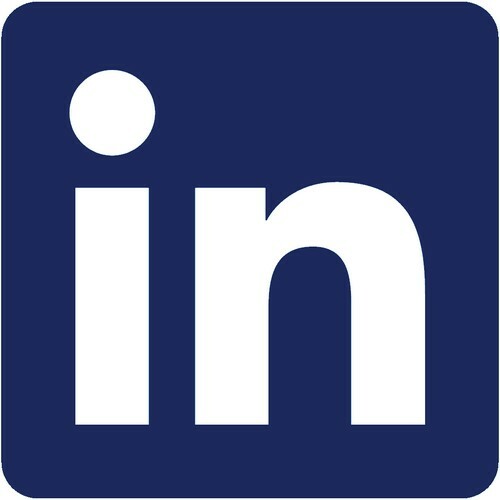 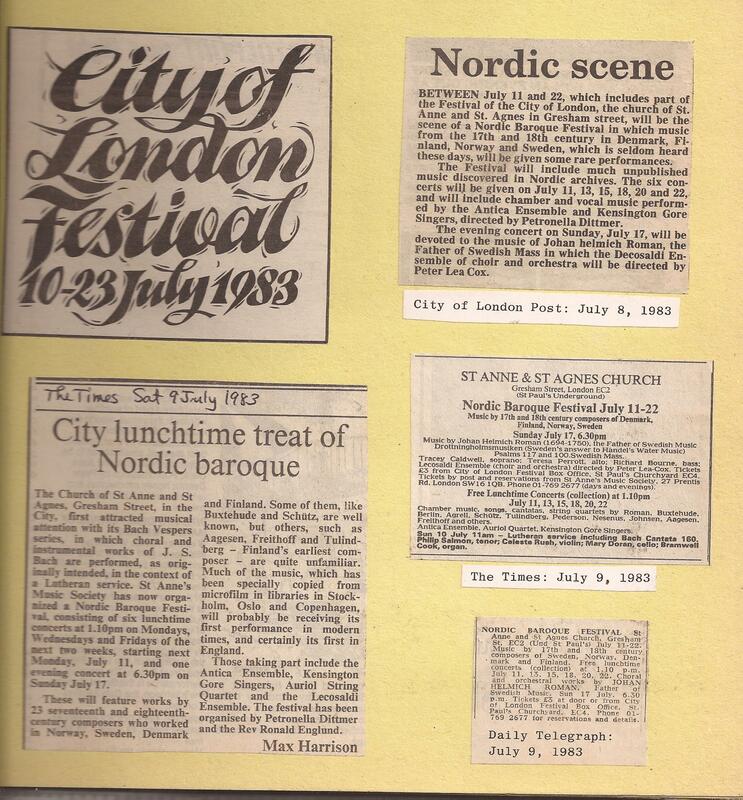 Download the order of service here. 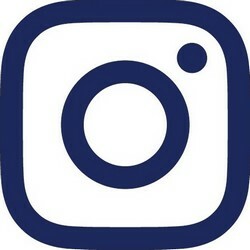 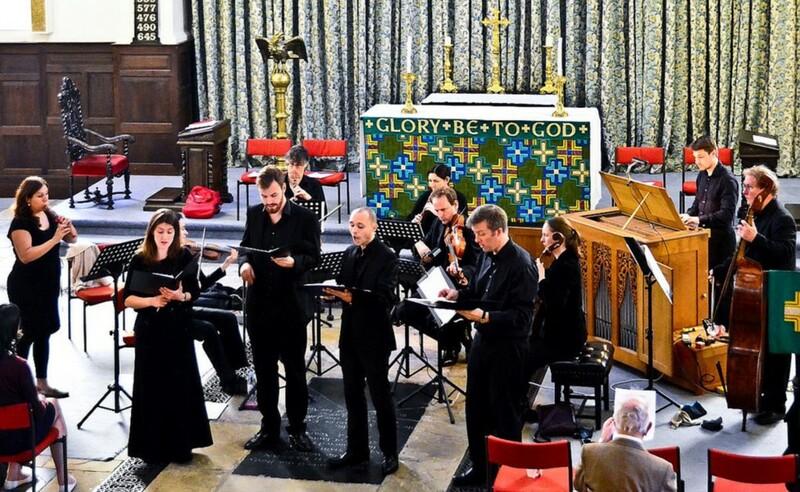 The Collective performed Cantata BWV 11, the Ascension Oratorio, at the American International Church on 21 May under the direction of Scott Stroman. 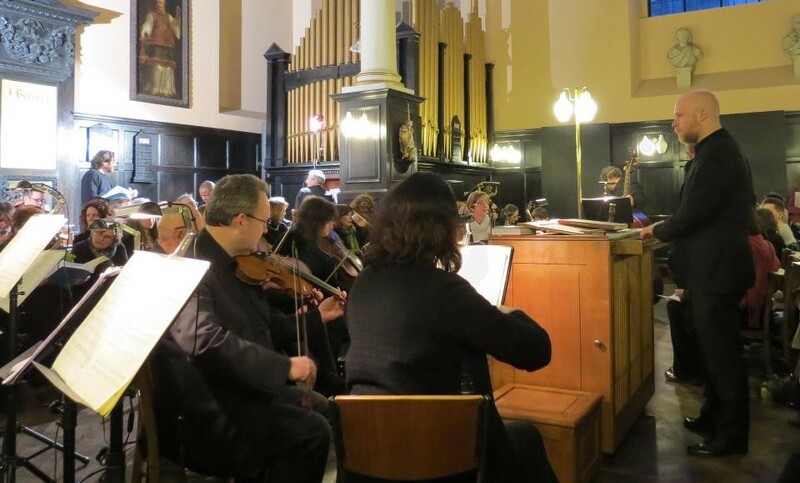 The Collective performed Cantata BWV 80 at the Dutch Church in the City on 7 May as part of an occasional series of Sunday afternoon services in partnership with the Dutch Church. 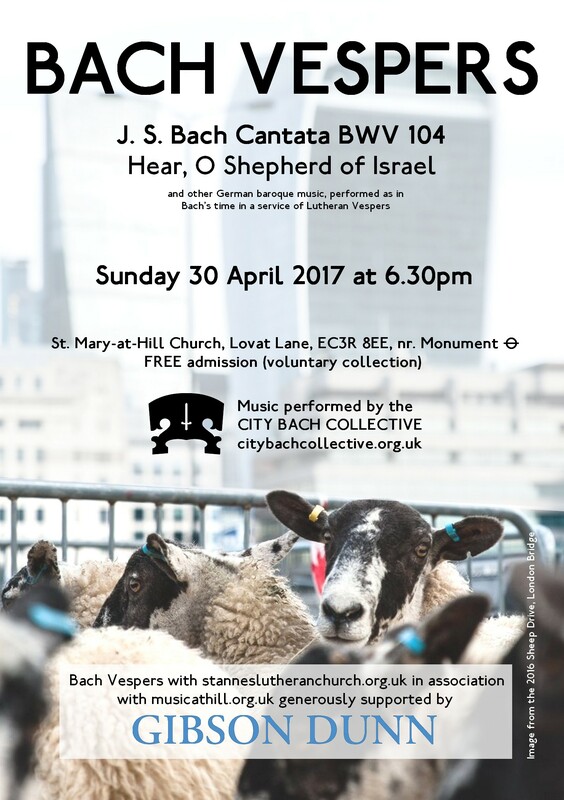 Bach Vespers 30 April 2017 features Cantata BWV 104. 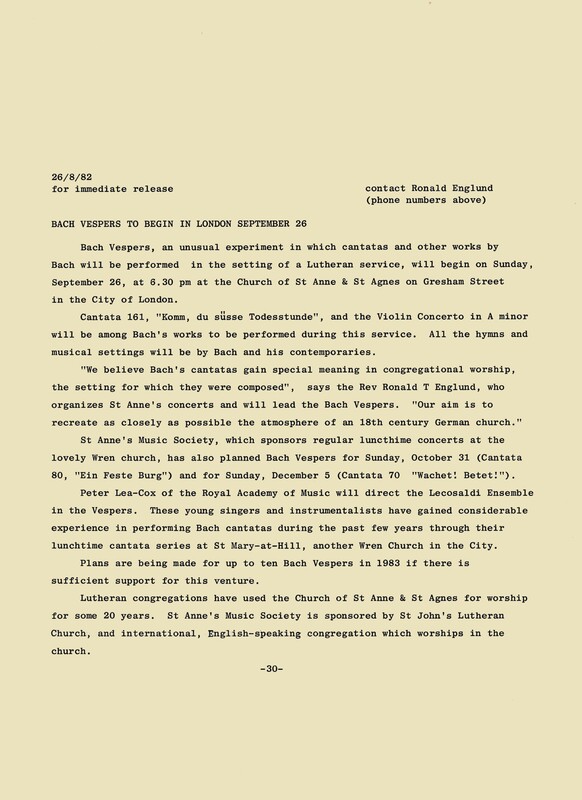 Download the order of service here. 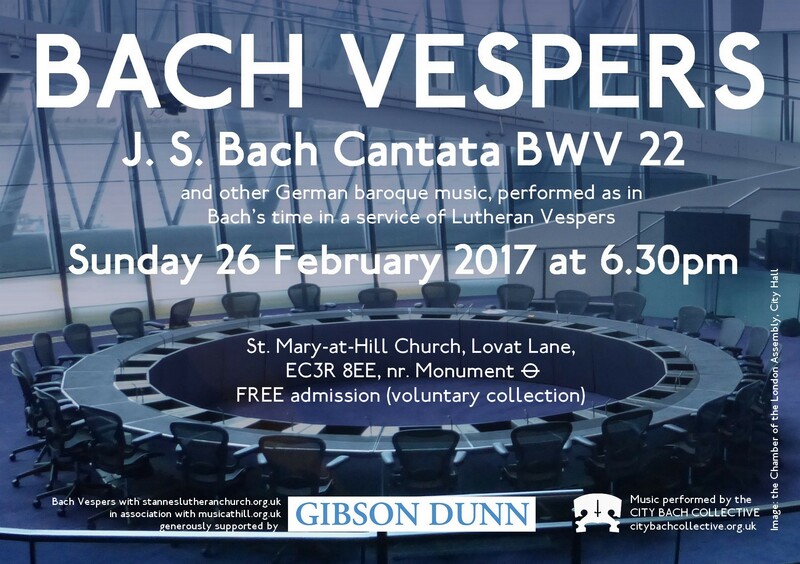 Bach Vespers 26 February 2017 features Cantata BWV 22. Download the order of service here. 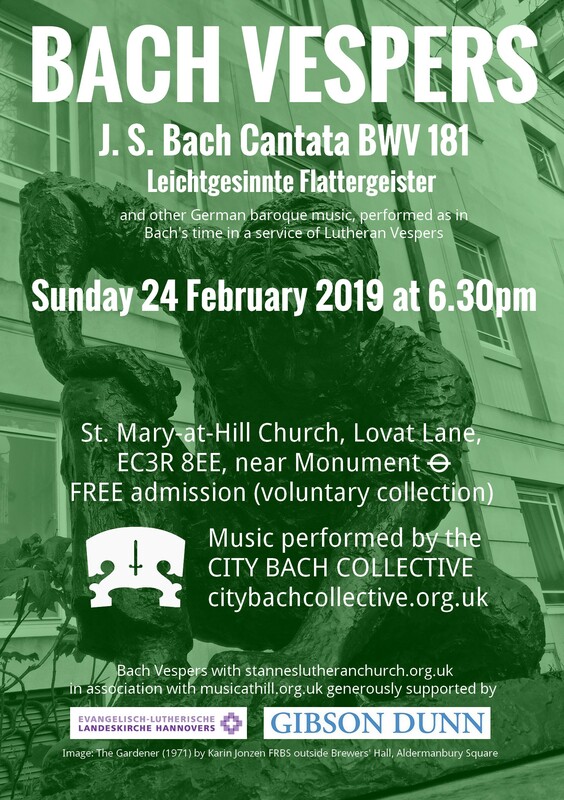 The City Bach Collective joined the choirs of King’s College Cambridge and the German Church in London for a special Reformation Anniversary year Vespers on 23 February 2017. 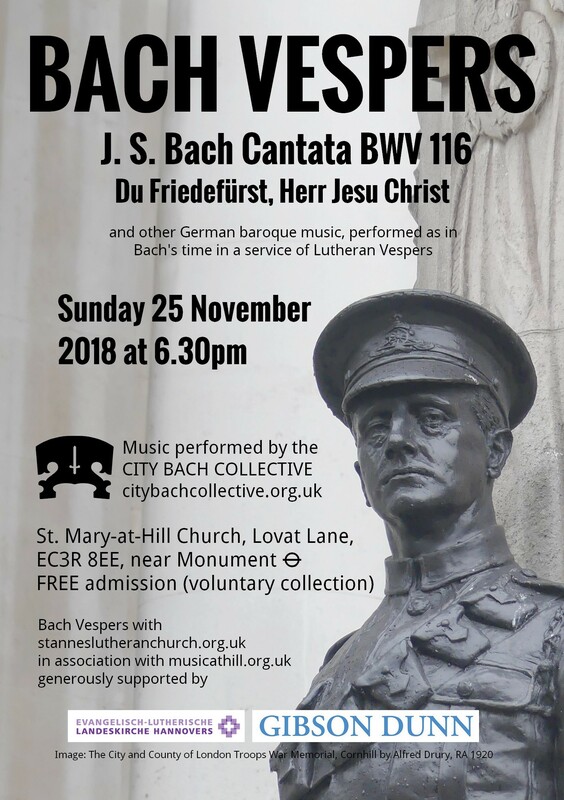 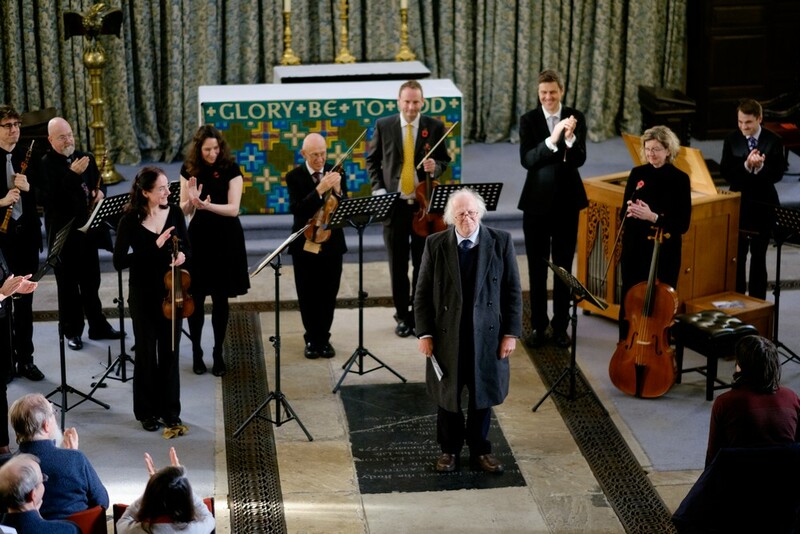 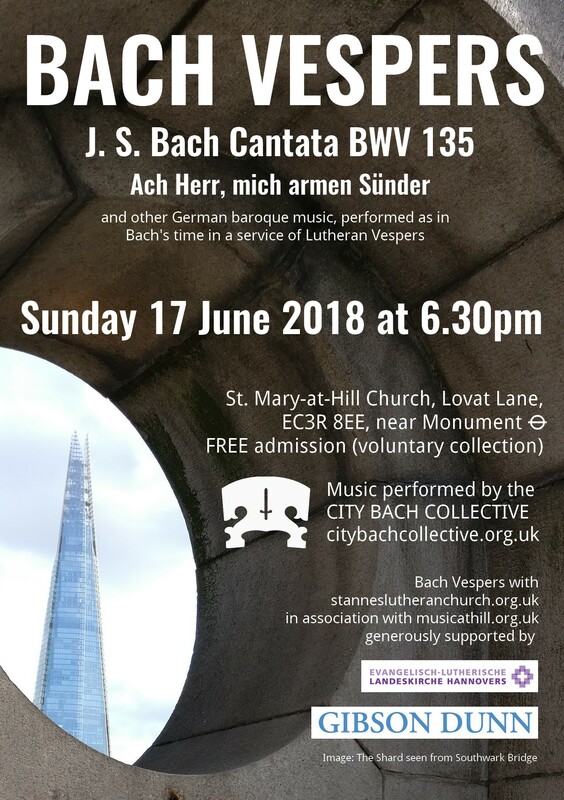 The music included J. S. Bach cantata BWV 79, Gott der Herr is Sonn und Schild, was conducted by Stephen Cleobury with soloists associated with the German Church in London. 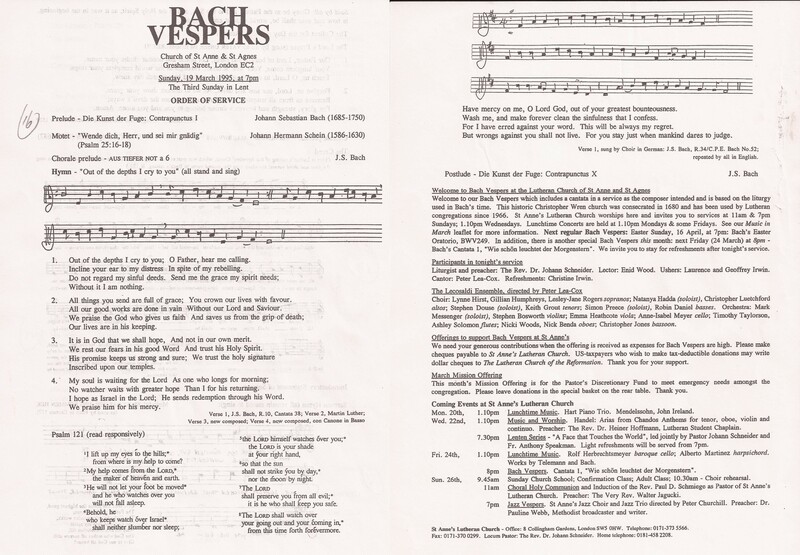 You can download selected pages for the Order of Service here. 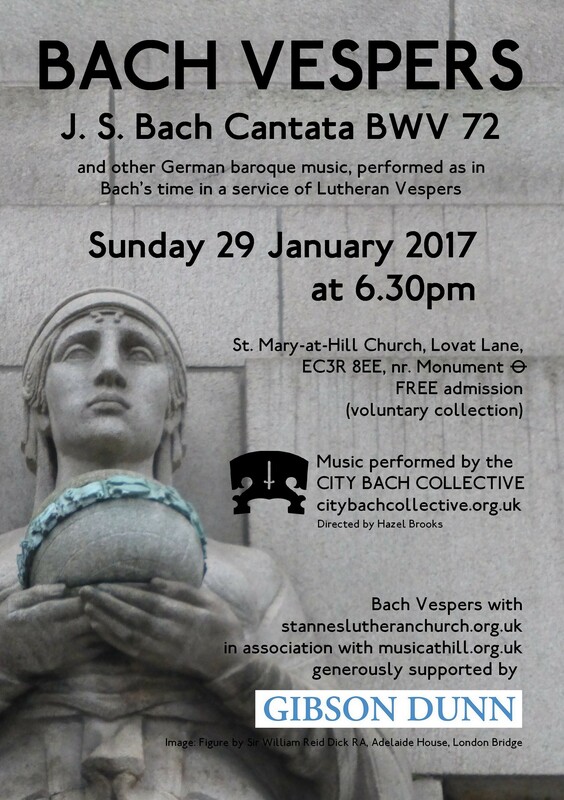 Bach Vespers 29 January 2017 features Cantata BWV 72. 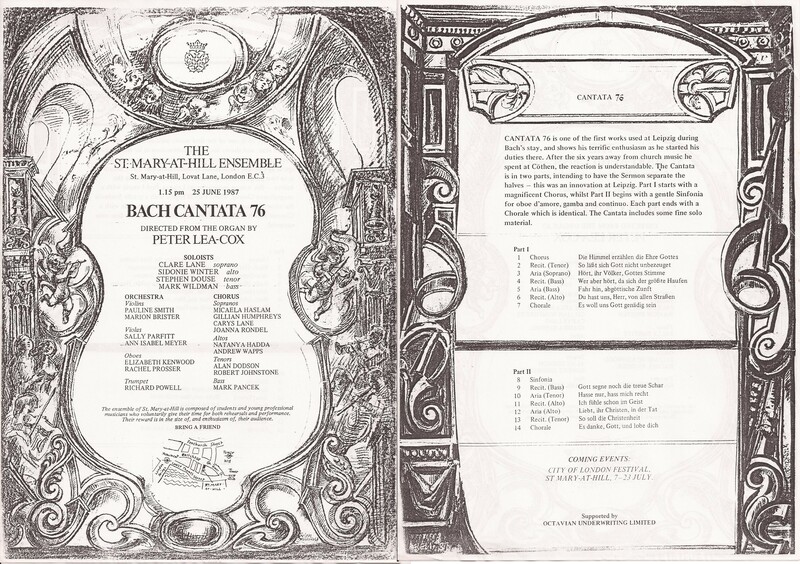 Download the order of service here. 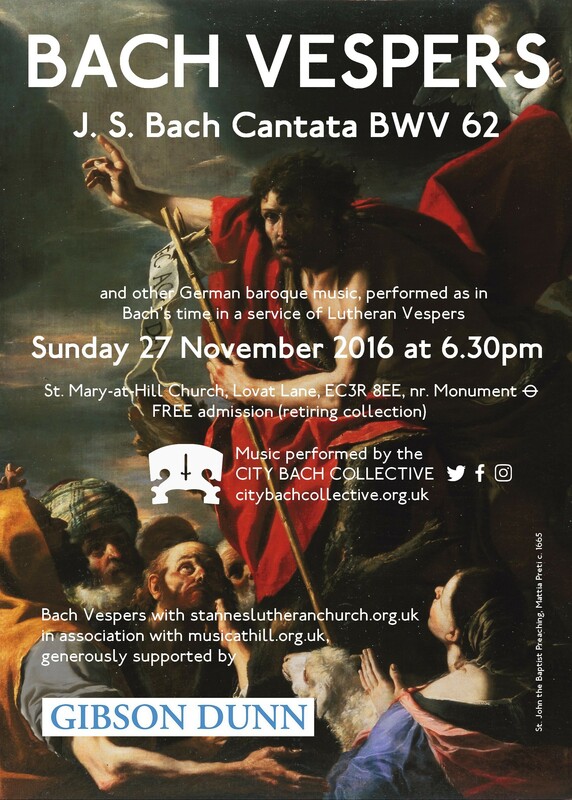 Bach Vespers 27 November 2016 features Cantata BWV 62. 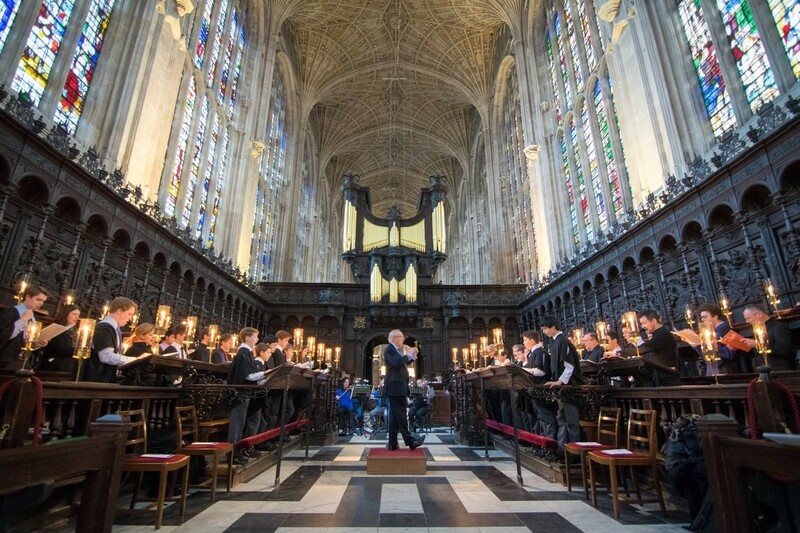 Download the order of service here. 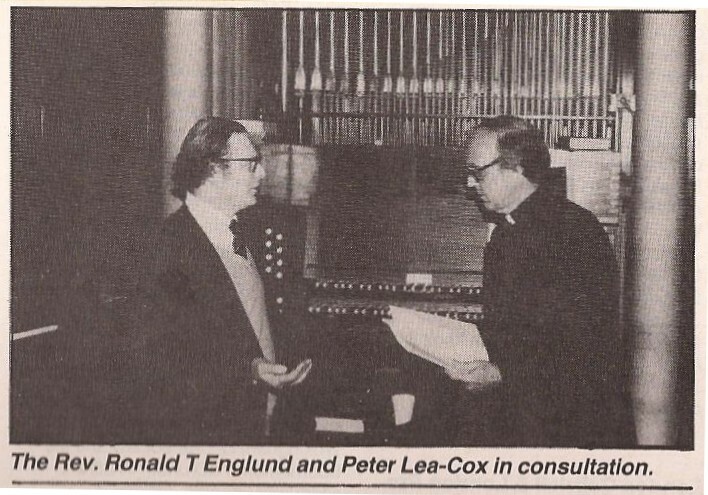 There’s a dedicated page with much more information here or you can view the official photos (by Joseph Ford Thompson photography, like the one of Peter, above) or download the programme via this link. 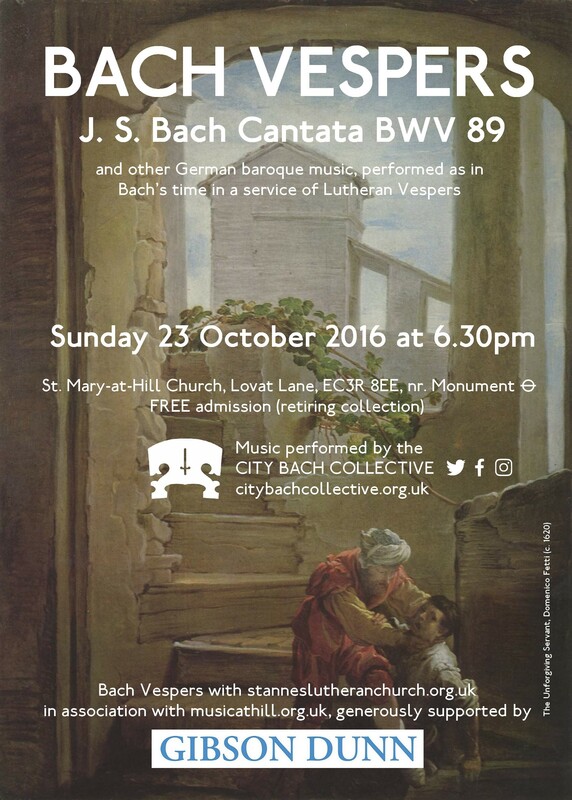 Bach Vespers 23 October 2016 featured Cantata BWV 89. 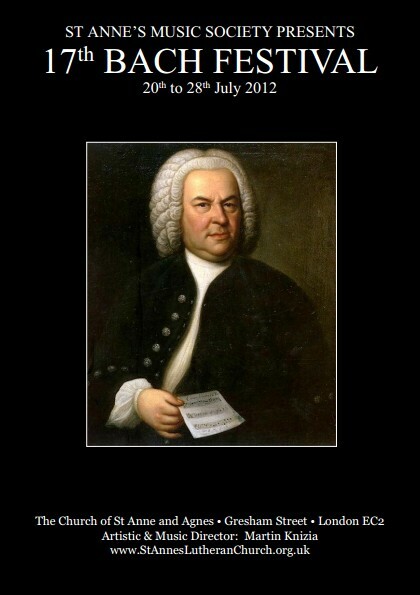 Download the order of service here. 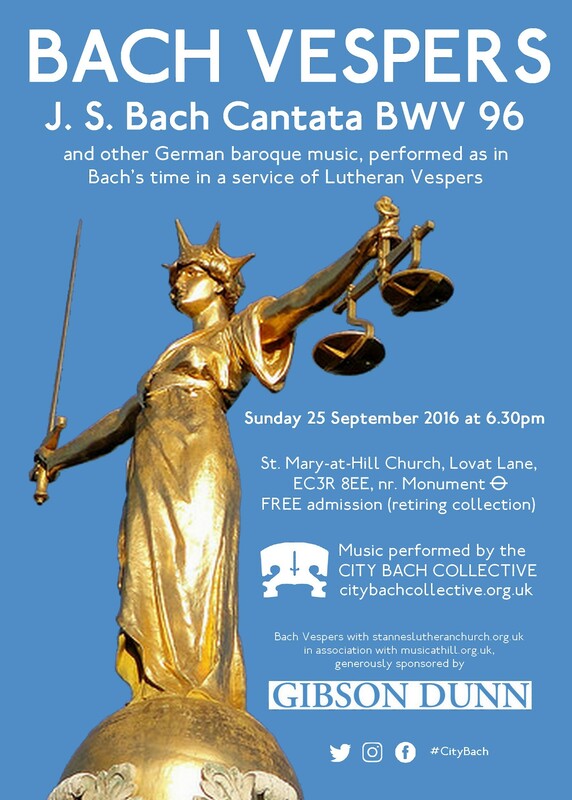 Bach Vespers 25 September 2016 features Cantata BWV 96. 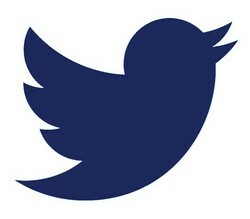 Download the order of service here. 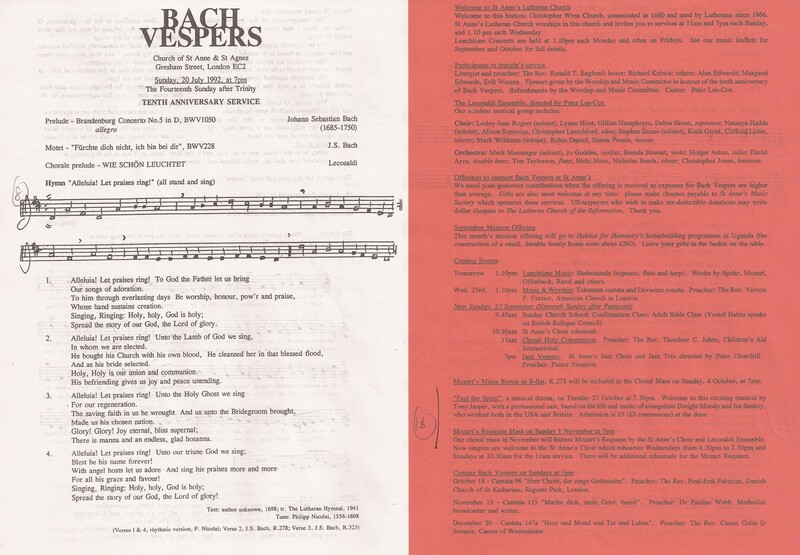 See an album of pictures (such as the one above) from this Bach Vespers here. 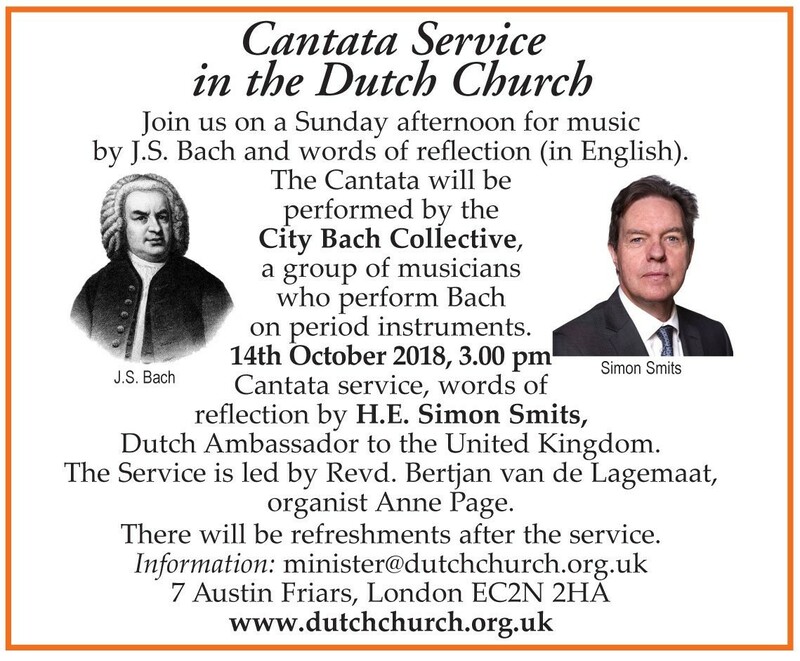 The Collective perform cantata BWV 105 at the Dutch Church in the City on 11 September in the first of a series of Sunday afternoon services in partnership with the Dutch Church. 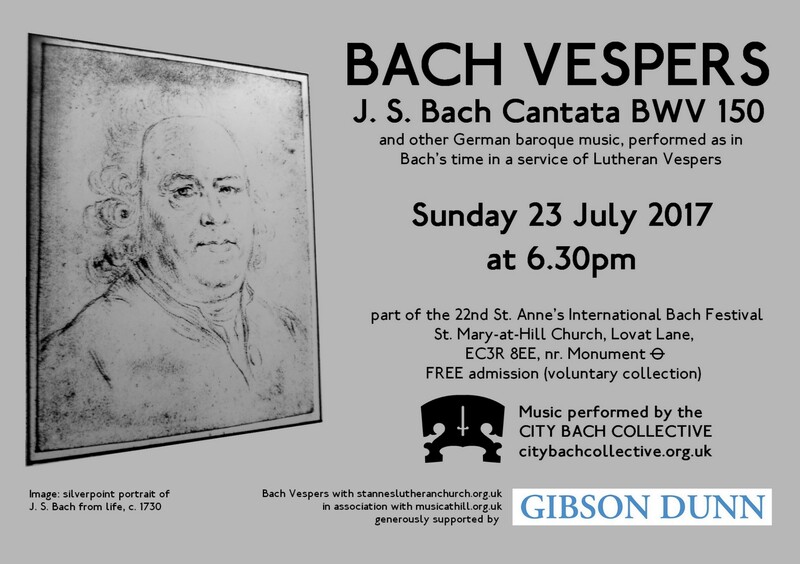 Bach Vespers 24 July 2016 featured Cantata BWV 105 & the opening Sinfonia of Cantata BWV 169. 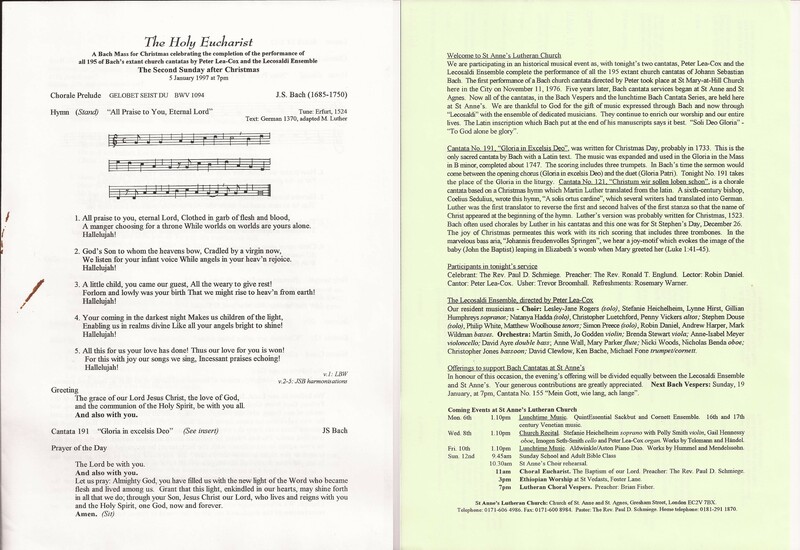 Download the order of service here. 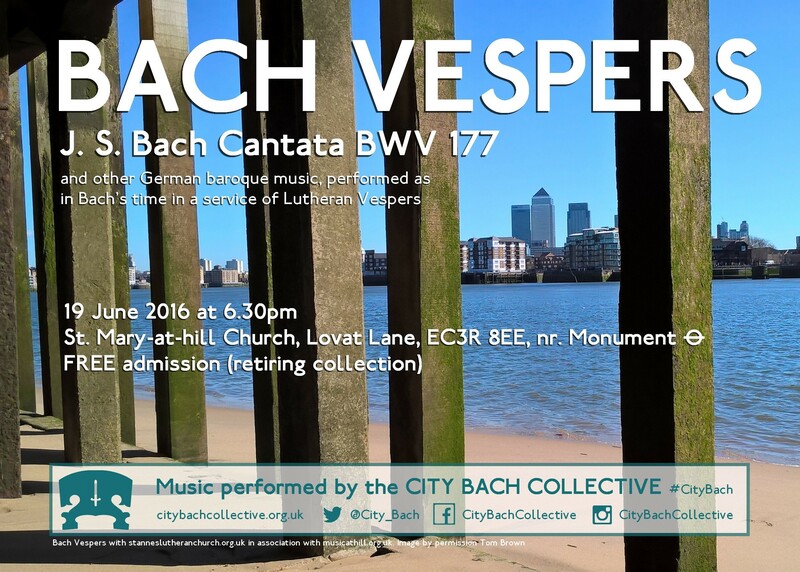 Bach Vespers 19 June 2016 featured Cantata BWV 177. 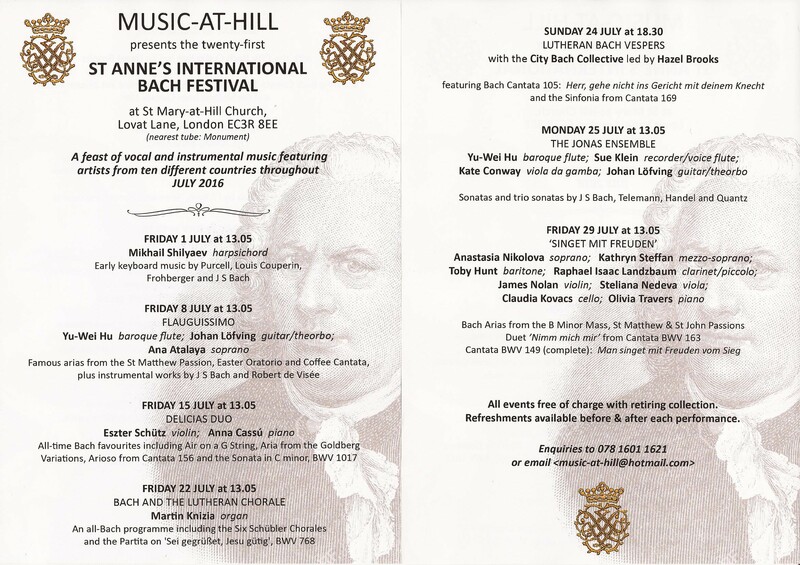 Download the order of service here. 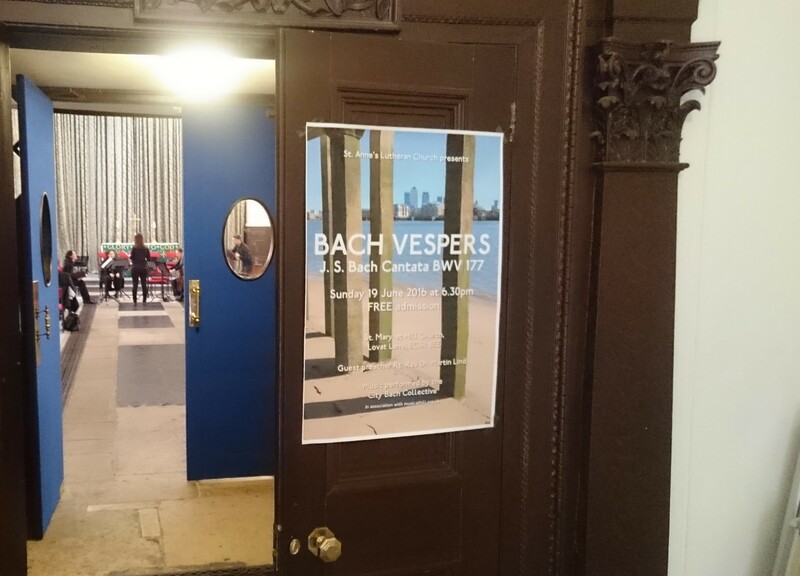 Bach Vespers 24 April 2016 featured Cantata BWV 166. 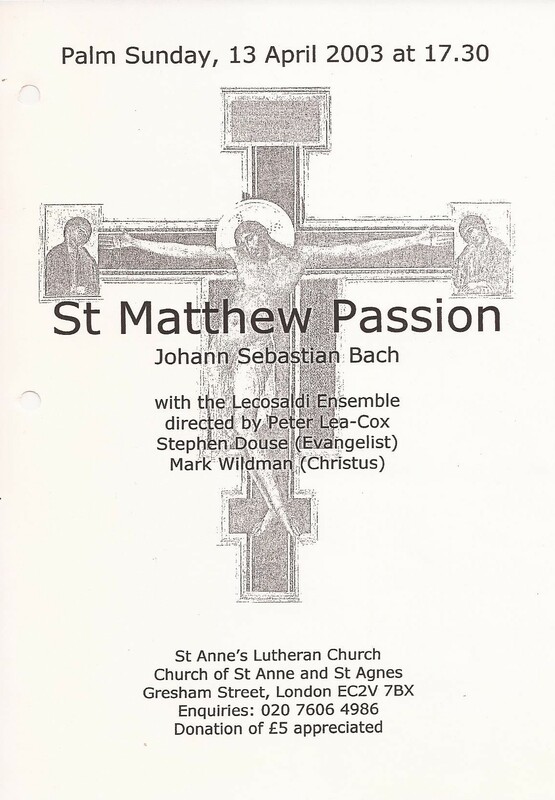 Download the order of service here. 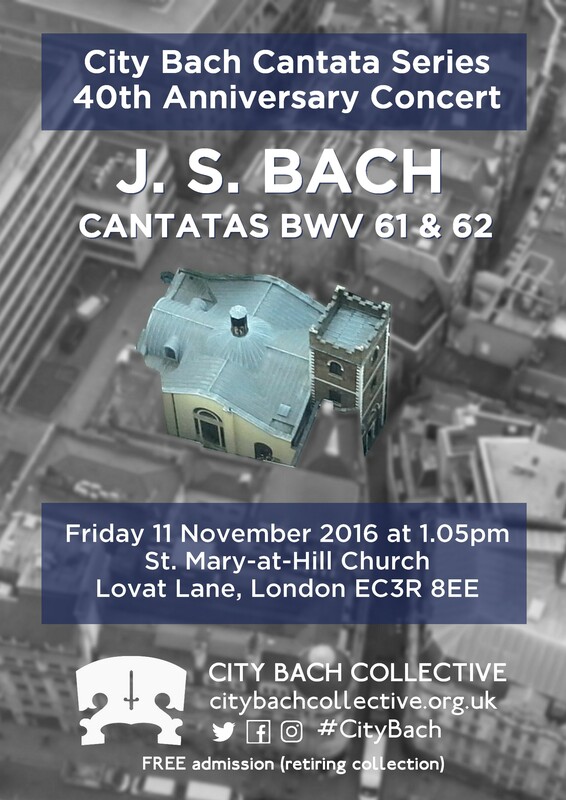 The first of the newly re-convened City Bach Collective’s Bach Vespers was on 31 January, and featured cantatas BWV 81 & 82a/iii. 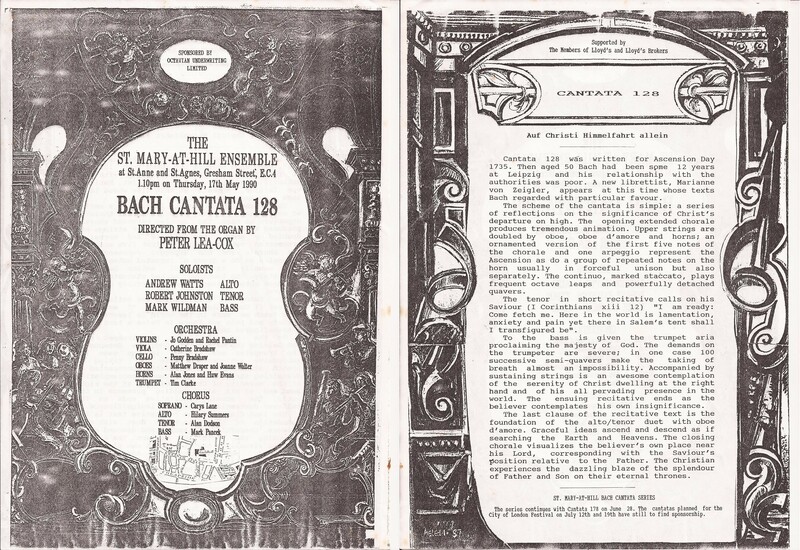 Download the order of service here. 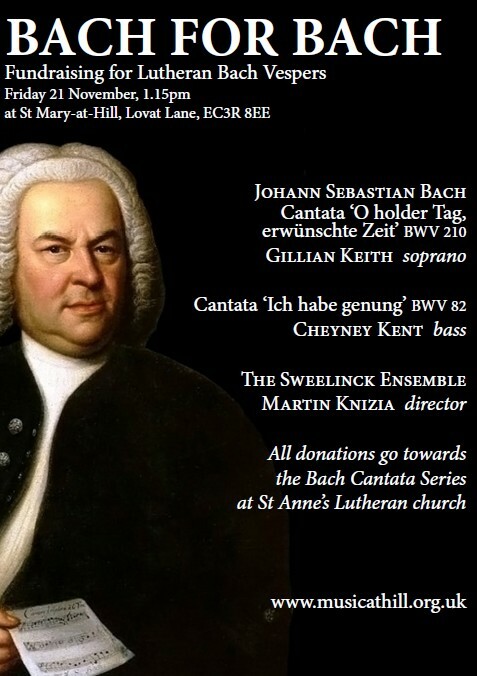 Fundraising concert for the Lutheran Bach Vespers series, 21 November 2014, featuring cantatas BWV 210 ‘O holder Tag, erwünschte Zeit’ with soprano Gillian Keith, and BWV 82 ‘Ich habe genug’. 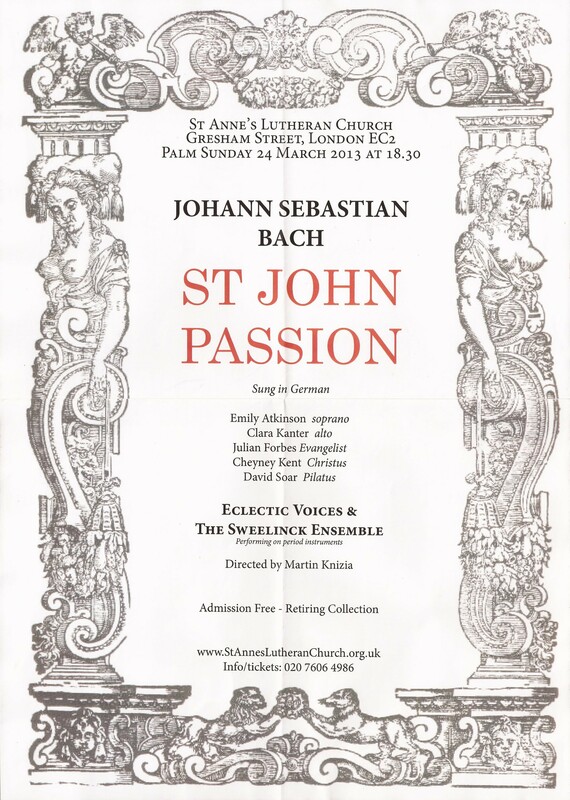 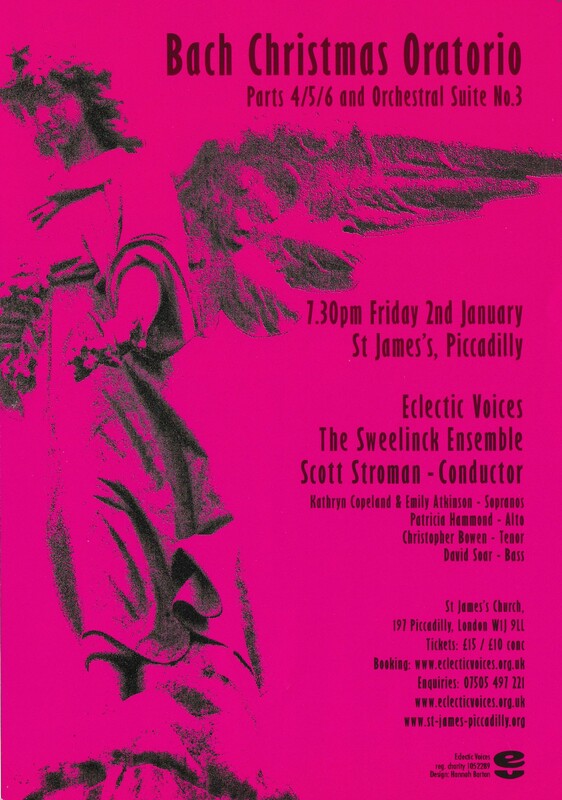 The Sweelinck Ensemble joined Eclectic Voices in March 2013 for a performance of Bach’s St. John Passion. 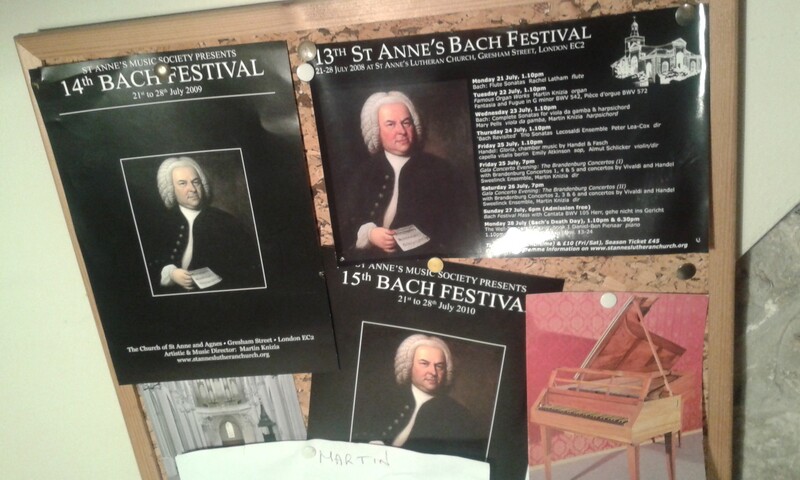 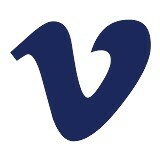 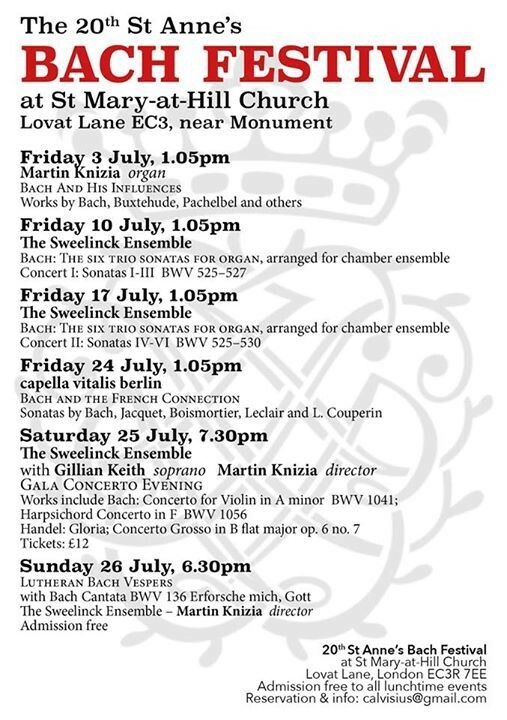 The 2012 Bach Festival 20-28 July. 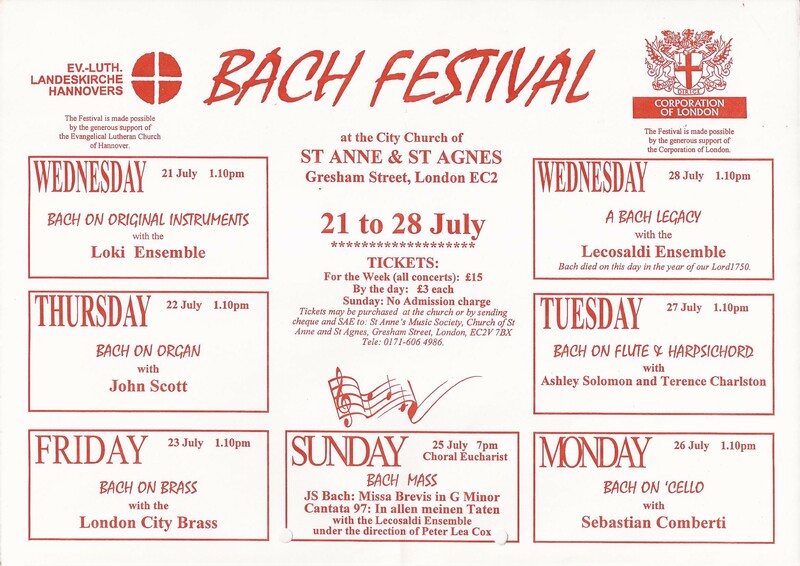 The final Bach Festival to be held at the church of St. Anne and St. Agnes, Gresham Street. 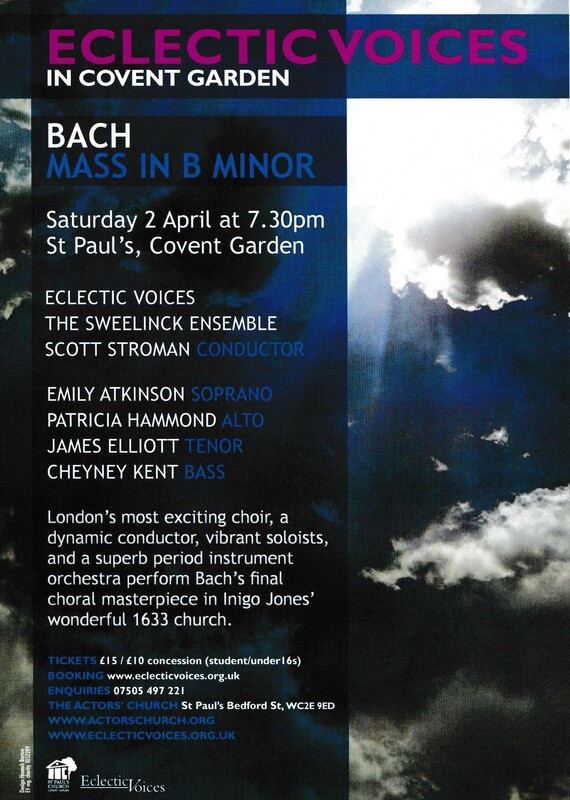 Bach B Minor Mass performed by the Sweelinck Ensemble with Eclectic Voices on 27 March 2011 at St. Anne and St. Agnes Church, Gresham Street and subsequently at St. Paul’s Church, Covent Garden. 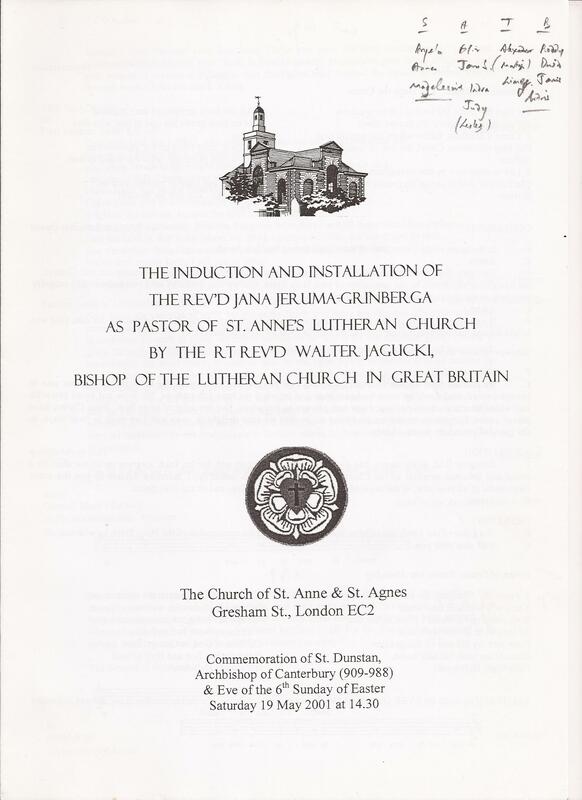 The Order of Service for the installation of Jana Jeruma-Grinberga as Pastor for St. Anne’s Lutheran Church in 2001. 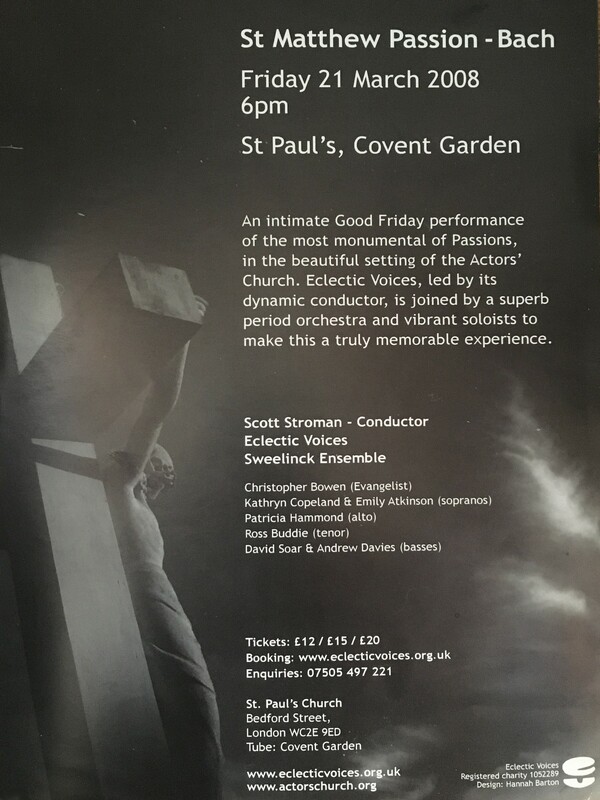 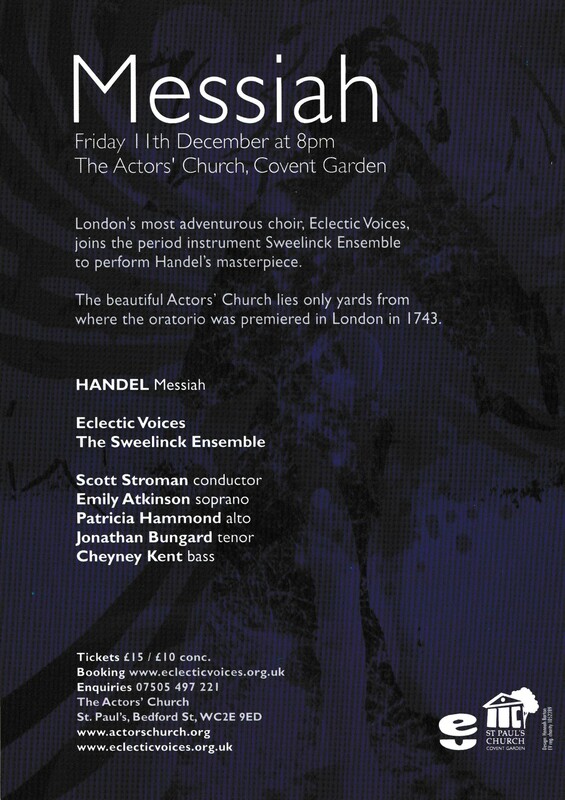 Peter Lea-Cox wrote a cantata for the event which was performed by Roderick Williams. 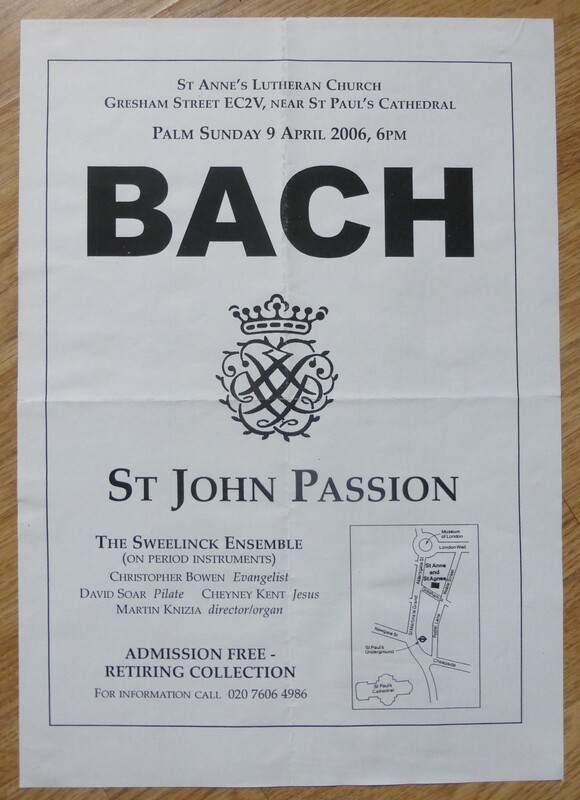 There was no Bach in this service: however, the Rev. 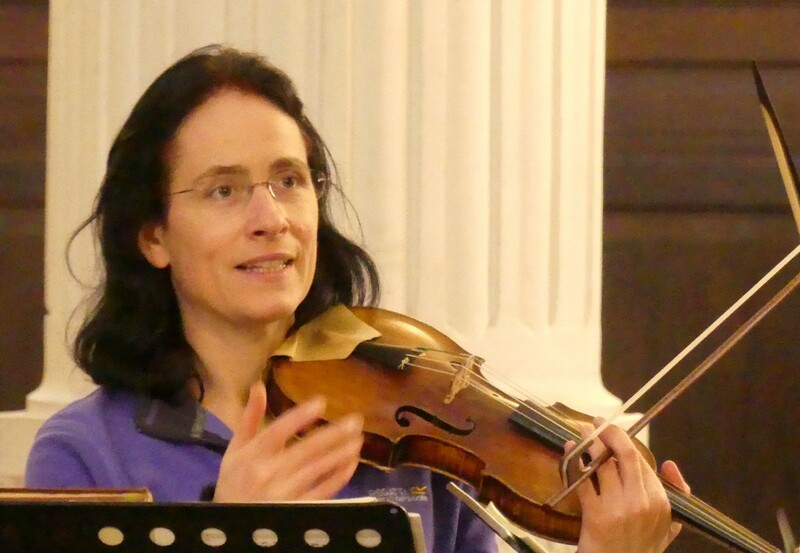 Jeruma-Grinberga, herself an accomplished musician, went on to be a strong advocate of the Bach Vespers series. 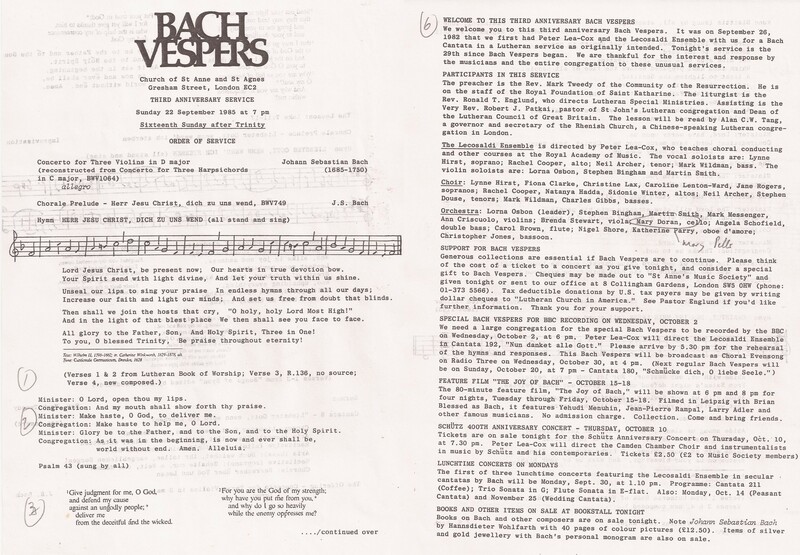 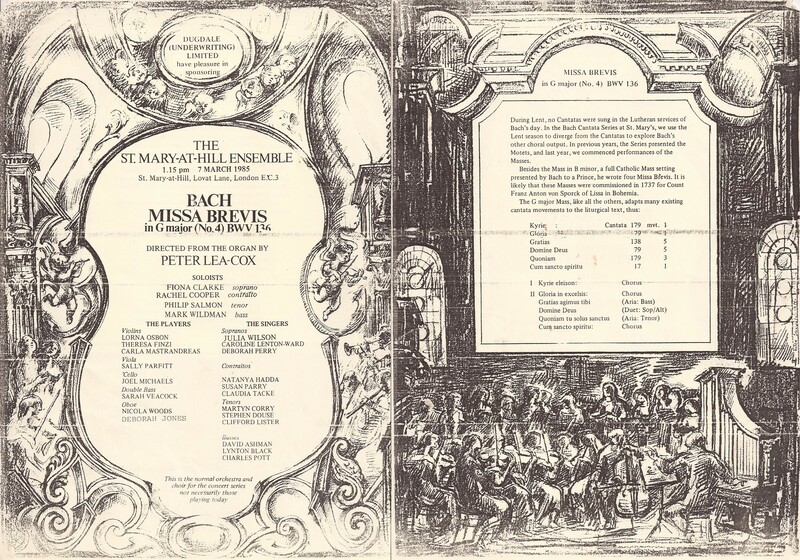 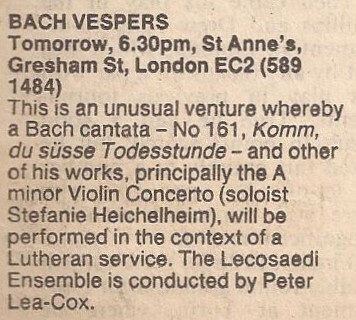 On the third anniversary of its establishment, an article in The American (September 1985) describes the success of the Bach Vespers series – and the ever-present threat to its survival, lack of funds. 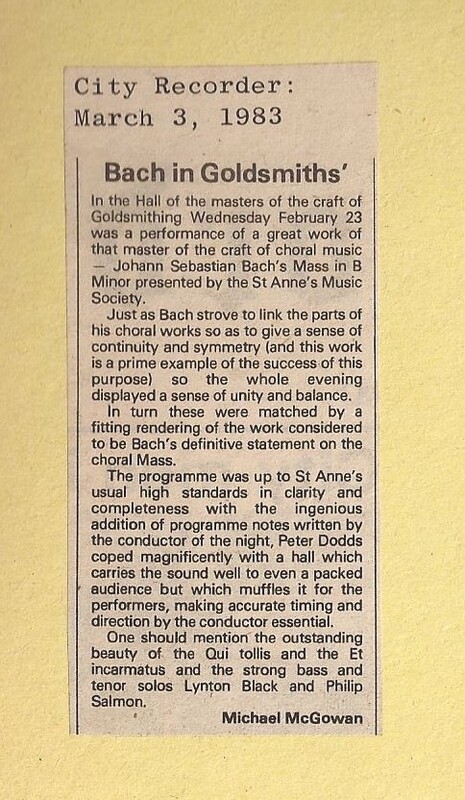 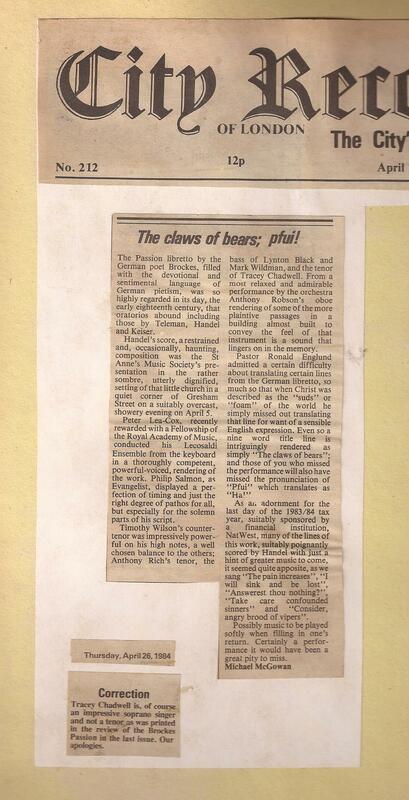 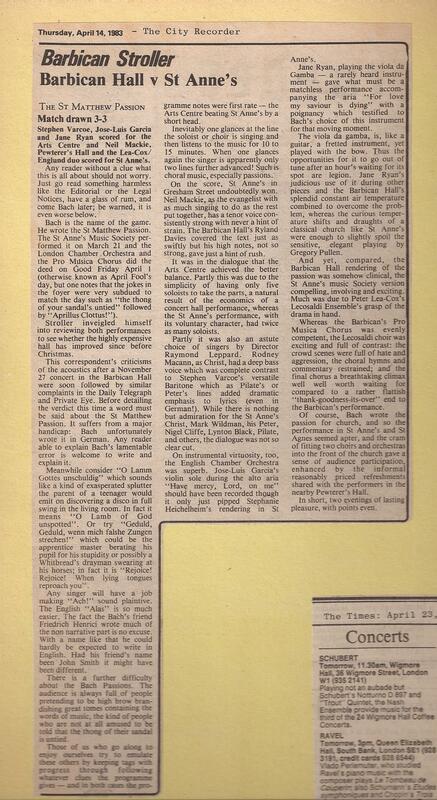 Review of the April 1983 St. Anne’s Music Society Bach St. Matthew Passion in the City Recorder. 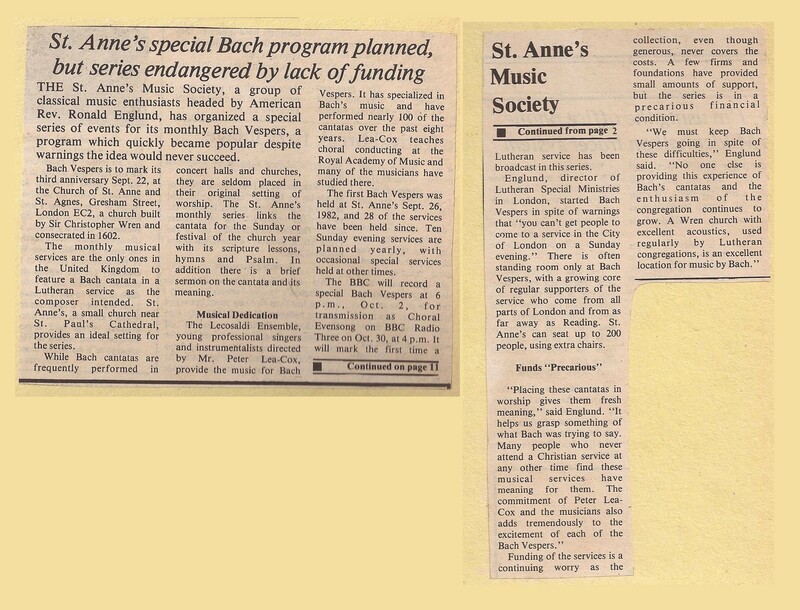 Notice of the St. Anne’s Music Society B Minor Mass, City Recorder March 1983.